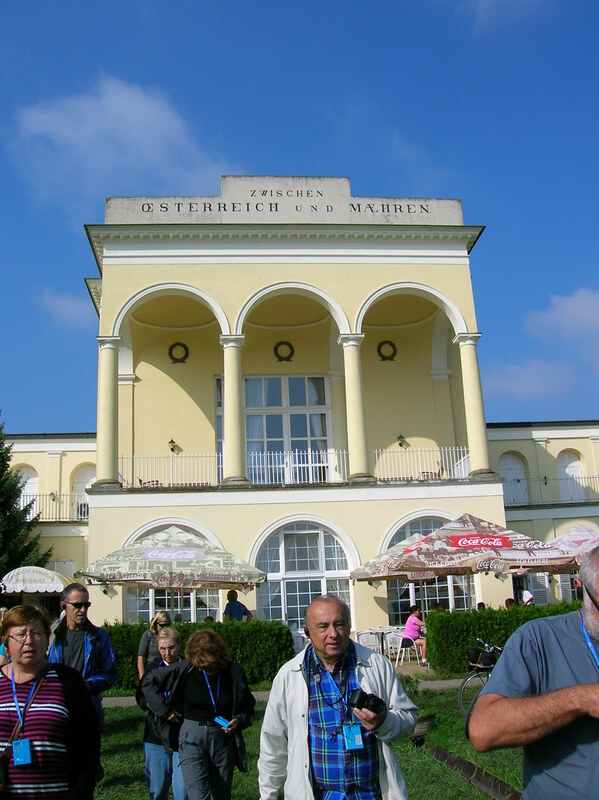 I traveled to Herrenchiemsee on a full-day excursion offered by Gray Line in Munich, the city where I was staying. 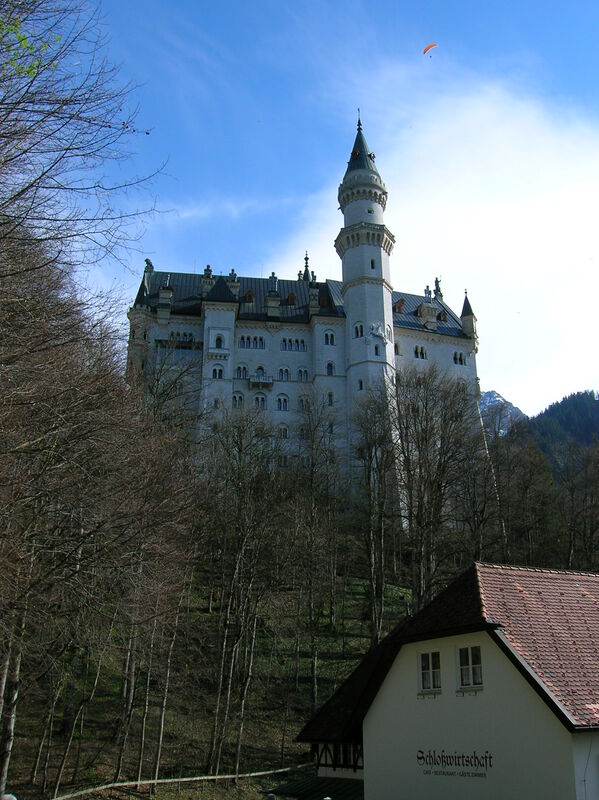 I had been so impressed with Neuschwanstein and Linderhof Palace that I longed to see more Bavarian castles. 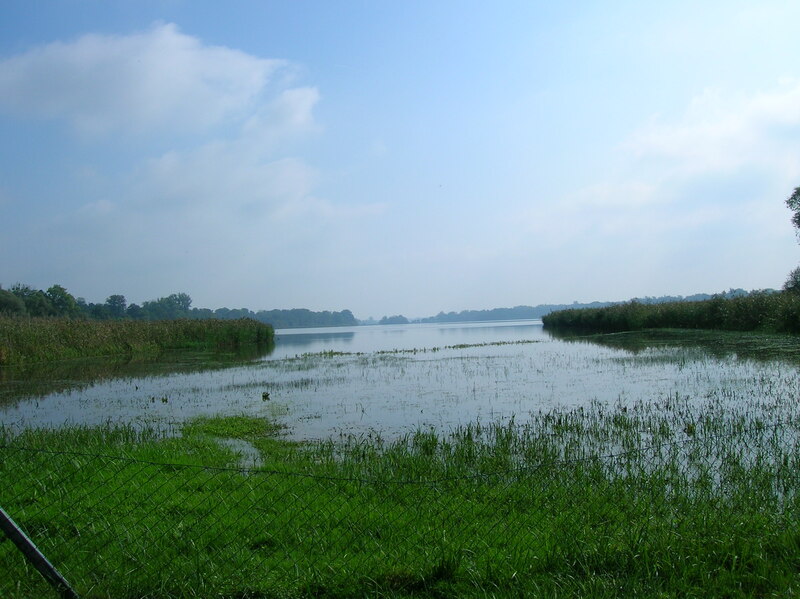 Herrenchiemsee’s location on an island made it sound remote and romantic. First, we took two boats to the Island of Fraueninsel, also called Frauenchiemsee or Ladies’ Island, a tranquil environment of 38.8 acres with 300 inhabitants and no crowds. The church with the distinctive onion-shaped tower was constructed in the 11th or 12th century during Romanesque times. The archway around the door dated back to that era. Romanesque frescoes inside the church hailed from 1130. The interior also included Gothic and Baroque characteristics. During the 14th century the flat wooden ceilings of the three naves were changed into star-shaped and net rib vaulting. A new high altar was added during the Gothic period as well. Even though fires broke out in the convent during 1491 and 1572, the damage was mostly confined to the exterior of the building. Two Renaissance altars were built in the 17th century. The Gothic altars were transformed into Baroque creations during the 17th century as well. The church has three naves, nine bays and 11 altars. There is a gallery with heavy Romanesque groin vaults. The round arched arcades are situated on rectangular pillars. The half columns have no capitals or plinths as well. The aisles of the main nave boast star-shaped rib vaults. The sacristy features Late Gothic vaulting and is two stories high. The altar stones are Late Gothic, but the altars’ upper structures are all Baroque in style. 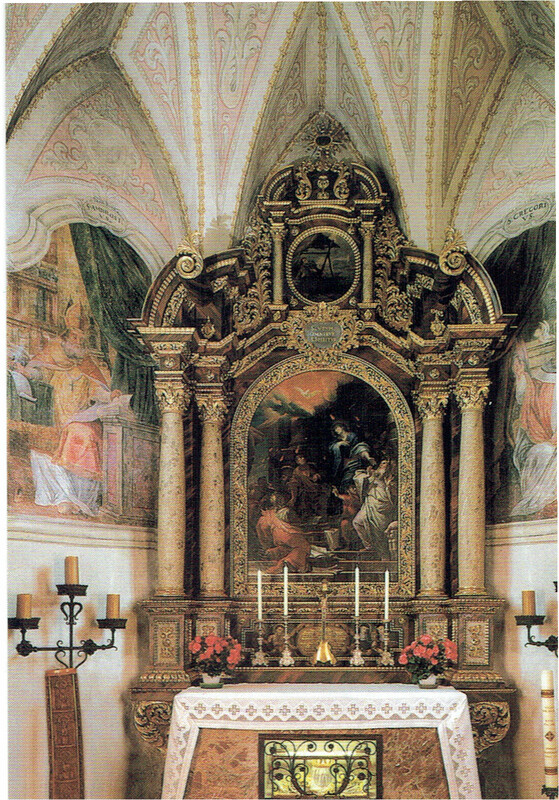 The high altar is High Baroque, created in 1694. In the middle of the 19th century the original altar was taken away, and a painting of The Risen Christ Appearing to His Mother replaced it. The upper part shows the crowning of the Virgin Mary. Saint Benedict, Saint John the Baptist and Saint George are a few of the holy characters who make appearances on the high altarpiece. We did not go inside the monastery, but I knew it had been founded by Bavarian Duke Tassillo III in the 8th century, making it the oldest monastery in Bavaria. In 830 about 45 nuns lived in a convent on the premises. Perhaps the monastery’s most famous abbess was Irmingard, a great-granddaughter of Charlemagne, living in the 9th century. A reliquary of the abbess’ remains is located in the church. Her life is still celebrated on the island. 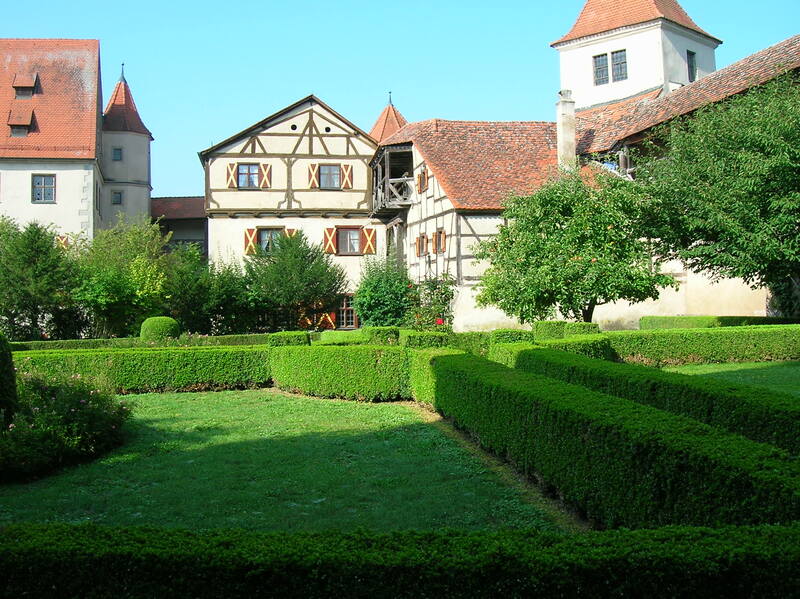 The convent holds the distinction of being the oldest still existing convent in Germany. As of 2007, about 30 sisters resided in the monastery. We also saw the picturesque cottages on the island and the fishmongers’ stands. The island was so serene. It made me feel at peace with myself and with the world. I felt as though I could accept the joys plus the hardships life had thrown my way. I had a strong feeling of self-acceptance. If only I could take strolls around this island every day, my life would be so much more balanced and much less stressful! 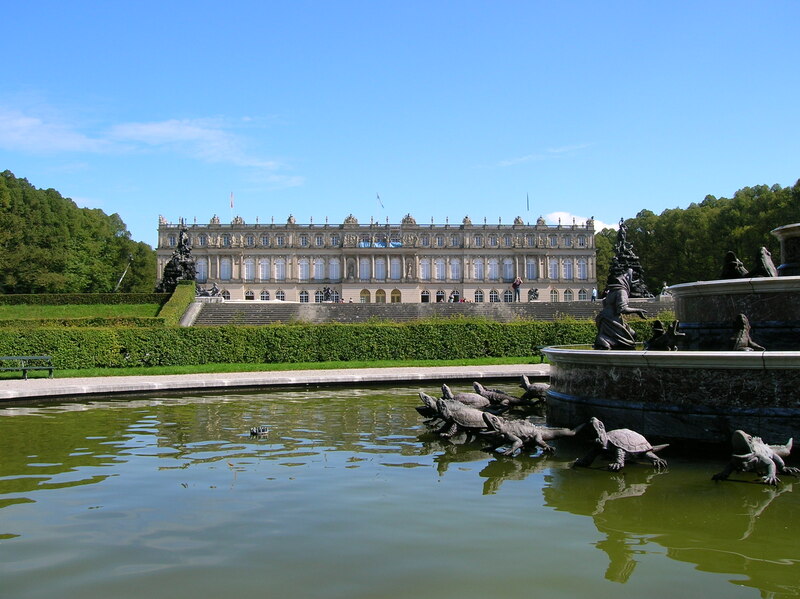 Then we took another boat to the New Palace and Old Palace of Herrenchiemsee. Tourists, notably absent from the Ladies’ Island, had flocked to the New Palace. 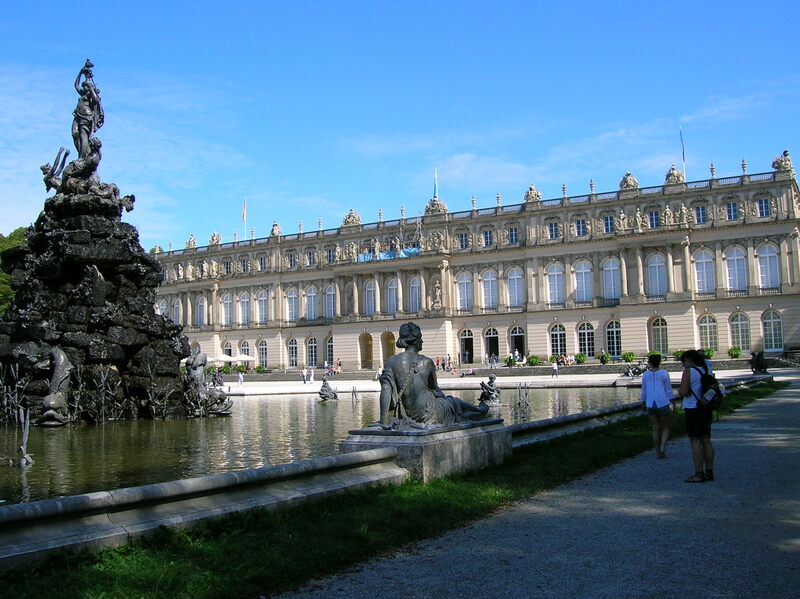 Created for “mad” King Ludwig II, Herrenchiemsee’s New Palace is a copy of Versailles, though it does differ in some respects. 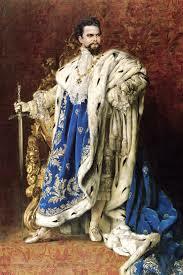 King Ludwig II created his own fantasy world because he was dismayed that he could not be an absolute monarch. 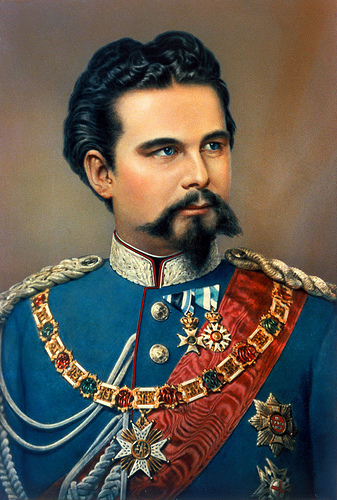 Ludwig II could not accept his royal post in a constitutional monarchy. He idolized French King Louis XIV, who led France for 72 years as the most powerful decision-maker in that realm. Soon after Ludwig became king, the government experienced a financial crisis, and Ludwig II withdrew from society, hiding in his own special, imaginative realm. First, I visited the ornate garden. 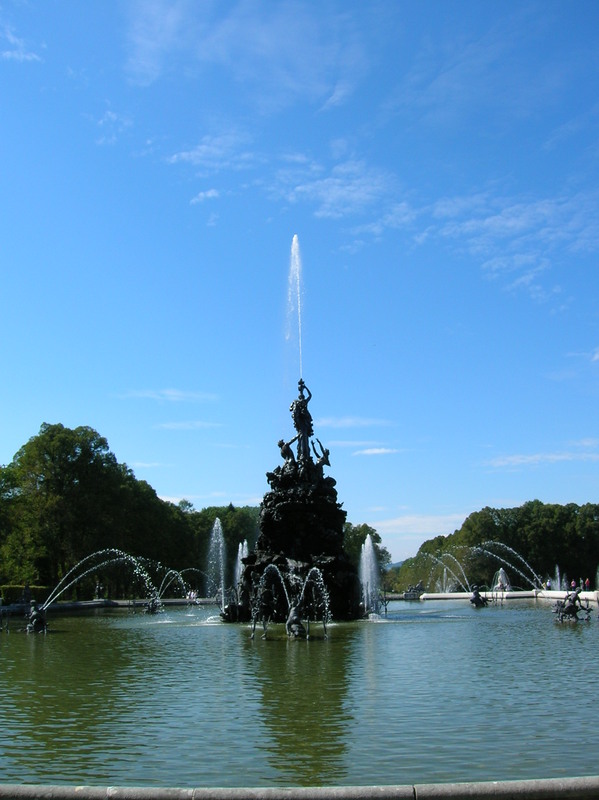 The fountains with stunning statuary impressed me as did the parterre with ponds. I saw marble statues of animals, of gods Diana and Venus and of Fata and Fortuna. Curiously enough, the garden was not an exact replica of that in Versailles. In fact, the statues of Fata and Fortuna had been greatly influenced by the gardens at the Spanish royal palace of San Ildefonso, Segovia. 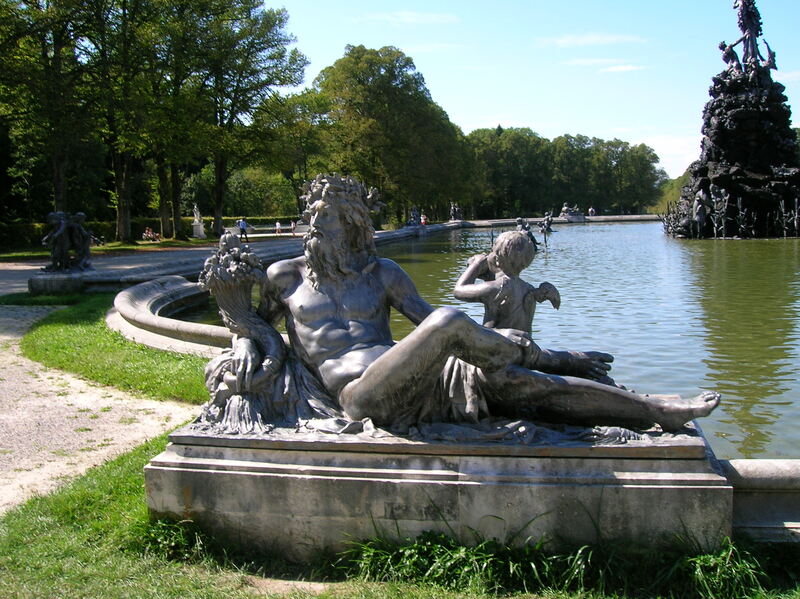 The Latona Fountain is based on the fountain at Versailles, though. 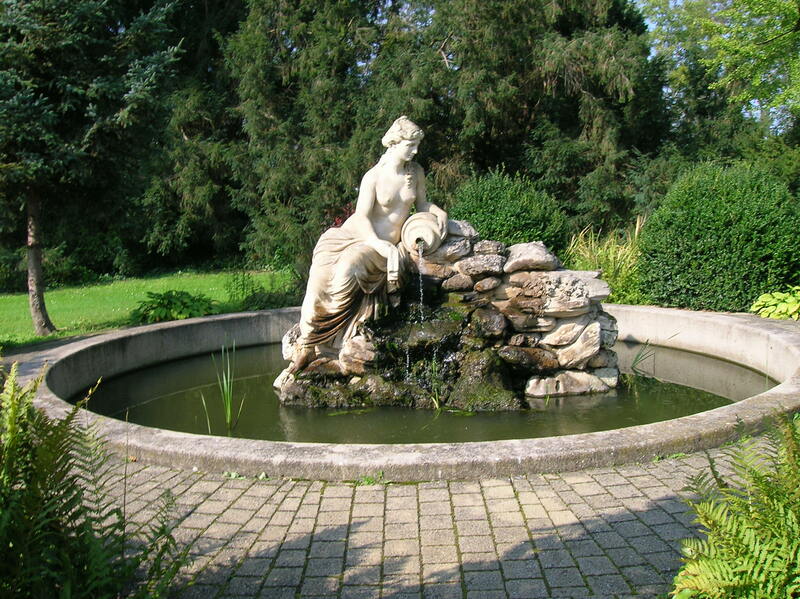 Latona, who had given birth to Apollo and Diana, stood proudly in the center of the fountain. Below her were the farmers she had turned into frogs plus tortoises and toads. After giving birth to Apollo and Diana, Latona wandered around the land. She came upon a pond and was very thirsty. However, the farmers would not let her drink from the pond. So, she changed them into frogs. I loved the sculptures of the frogs and tortoises. The figures of the animals seemed so playful rather than merely majestic. They brought a smile to my face. Then came the tour of the New Palace. The guide explained that there is nothing Bavarian in the palace. 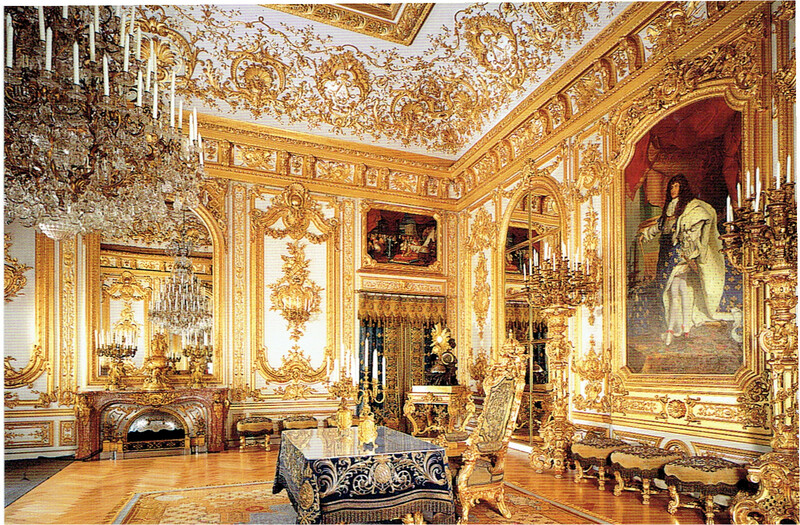 Everything was inspired by Louis XIV or Louis XV. We walked up a grandiose staircase that was a replica of the one at Versailles, the version that was destroyed in France during 1752. Stucco marble and statues, paintings, a crystal chandelier and a marble fountain showing Diana with two nymphs all added to the grandeur. However, there was an intriguing 19th century element – a glass roof that somehow complemented the classical characteristics. I was surprised that the skylight did not look out-of-place or mar the elegance of the staircase. In the Bodyguard Room I saw copies of halberds from Versailles. The ceiling fresco boasted a mythological theme, showing the triumph of Mars as the god peers at a burning city while gripping a white-and-red flag. Stucco marble paneling gave the room a sort of charm. Notably, no guards had ever been stationed in the Bodyguard Room. In the First Antechamber the white and gold paneling was stunning. The ceiling painting glorified Bacchus and Ceres, who was the goddess of agriculture and fertility, among other things. I was fascinated by the Cornet Cabinet made with the Boullete technique, which was a French way of sculpting. The cabinet was inlaid with dark brown tortoiseshell and showed off gilt bronze figures. The professional and eloquent guide opened the cabinet. I expected to see some ornate jewels inside. However, it was empty because King Ludwig II had never said what he wanted to store there. The Second Antechamber included large bureaus, and the chandeliers seemed to enlarge the size of the room in a mirroring effect. 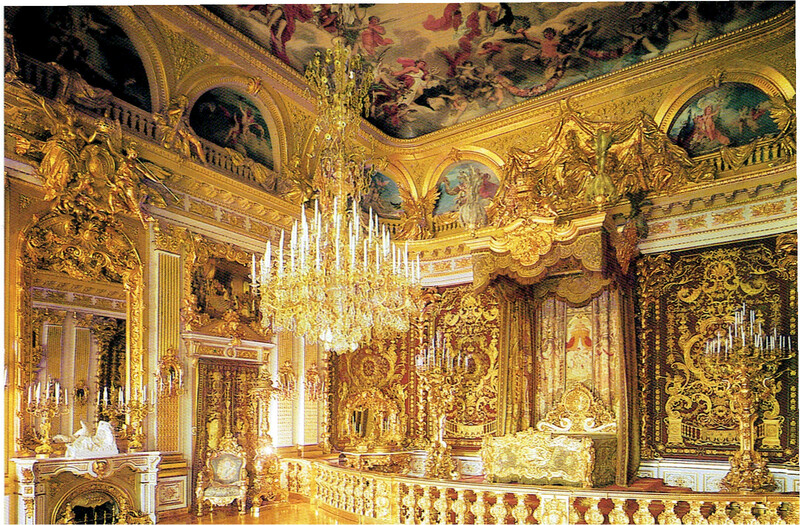 Overall, there were 50 chandeliers in the palace, made of Bohemian lead crystal and gilded bronze. A bronze statue showed King Louis XIV on horseback. I was enamored by the detail of the horse’s mane and the riding boots. The draperies astounded with green silk and golden embroidery. The State Bed Chamber was not a copy of the one at Versailles. It was, in fact, much more lavish than its French counterpart. The space featured a gold leaf gilded bed. Red velvet carpet with designs of suns covered the steps leading up to the bed. How I would like to sleep there! The red velvet textiles were made utilizing needlework and gold embroidering and boasted scenes of Venus and Cupid. However, King Ludwig II never slept there. 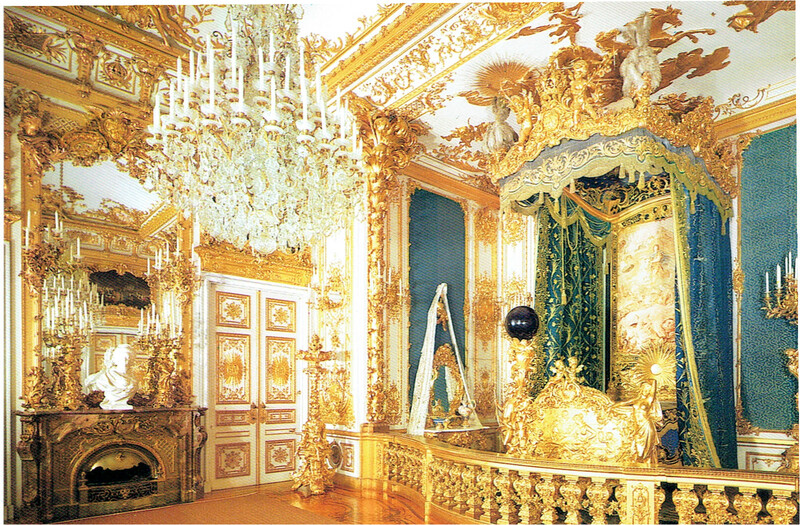 He intended it to be only a copy of Versailles, not his personal bedroom. A life-size portrait of Louis XIV graced the Council Chamber or Conference Hall, carved in gold and white paneling. The Bourbon lily design was displayed on the carpet and curtains. The largest clock in the palace was in the room, too. There was at least one clock in every room in the palace. This particular clock, made with inlaid rosewood designs and gild bronze fittings, had been constructed for King Louis XIV. The ceiling painting portrayed the gods at Olympus. I took note of the white horses rearing up as though they were frightened of something. The Hall of Mirrors was impressive as well. 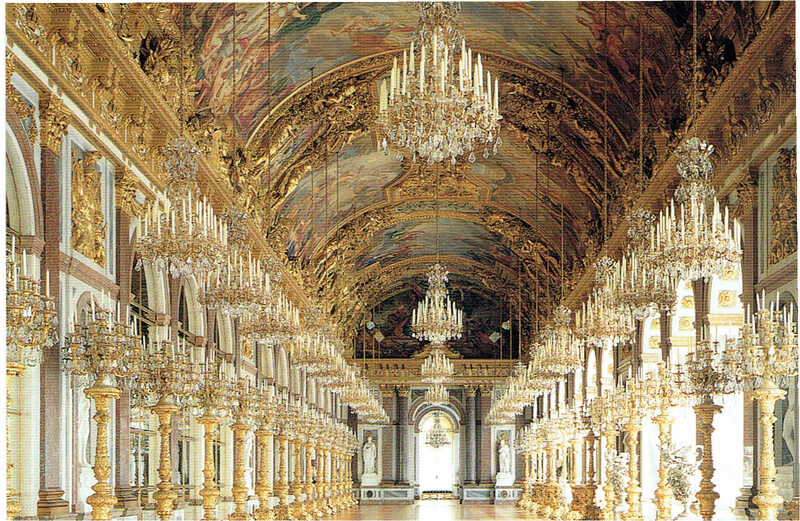 The Hall of Peace and the Hall of War were copies from Versailles. They were overwhelming. Some 2,200 candles were in the rooms. It had taken 30 to 40 servants to light them. The space also featured 35 chandeliers. The ceiling frescoes were stunning, copies of frescoes from Versailles showing battles with the French in the Spanish Netherlands, which resulted in a peace treaty during 1678. Both the Hall of Peace and Hall of War were decorated in stucco marble of various hues, and each hall boasted the busts of four Roman emperors. The halls there measured in total 98 meters in length. They were six meters longer than the ones in Versailles. Next we saw the private apartments built in the style of King Louis XV, but not totally faithful to the rooms at Versailles. The Second Rococo style of the rooms had been influenced by 18th century French and German palaces. 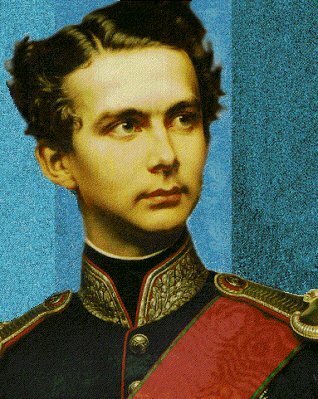 King Ludwig II actually lived there from September 7 to September 16, 1885. The Bedroom was decorated in blue, King Ludwig’s favorite color. I recalled that the elegant bedroom in Neuschwanstein was also decorated in this color. The bed was two meters and 40 centimeters long with a width of one meter and 80 centimeters. (Ludwig II stood one meter and 93 centimeters tall.) 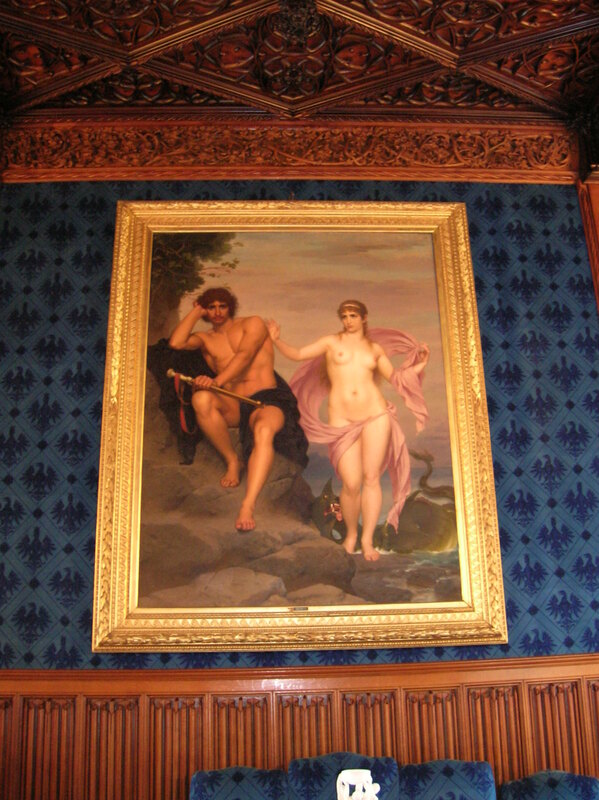 Statues of Venus and Adonis also featured prominently in the room. The ceiling painting dealt with mythological figures. When candles had been lit in this space, the blue globe light resembled moonlight. What an atmosphere that must have been! The space featured two secret doors as well. The King’s Study was dedicated to Louis XV. I was enamored by the 1884 roll-top desk that was a replica of a desk that Louis XV had owned. How I would love to compose pieces on that! It was the most valuable piece of furniture in the palace, inlaid with 16 kinds of wood. Two astronomical clocks decorated the room. A half-ton chandelier was on display, too. Green velvet curtains showed off gold embroidery. The King’s Dining Room featured the most expensive chandelier and floral décor. 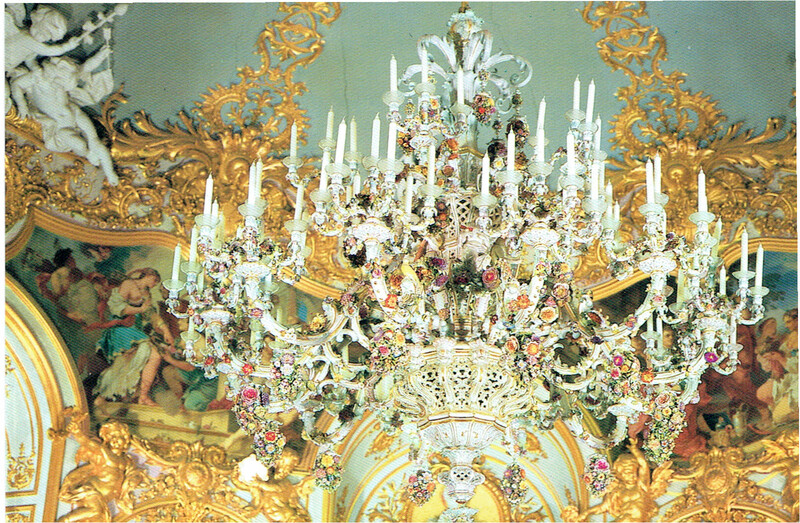 The 18-armed Meissen chandelier was breathtaking. 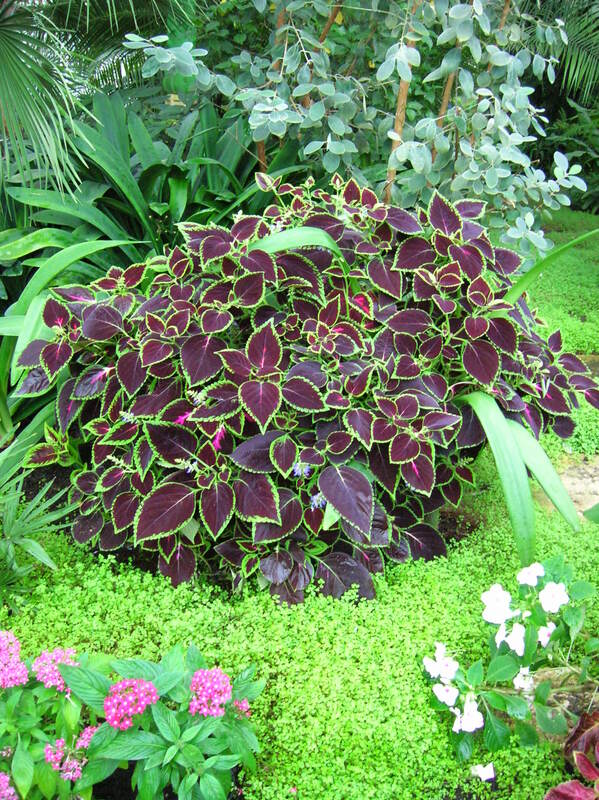 It showed off flower buds in various colors and tiny birds. The chandelier had been assembled in the room from small pieces. It was one of the most original chandeliers I had ever seen. Below it were white flowers in a vase made of porcelain. The table was called a “Tischlein-deck-dich.” It could be lowered when servants needed to set it and then could be hoisted back up, so Ludwig II could dine alone without servants interrupting him. It reminded me of a similar sort of table at Linderhof Palace. White and gold paneling added to the room’s opulence. A porcelain cabinet in the corner of the room also proved intriguing. This space had taken its look from a room in the Hotel de Soubise in Paris. 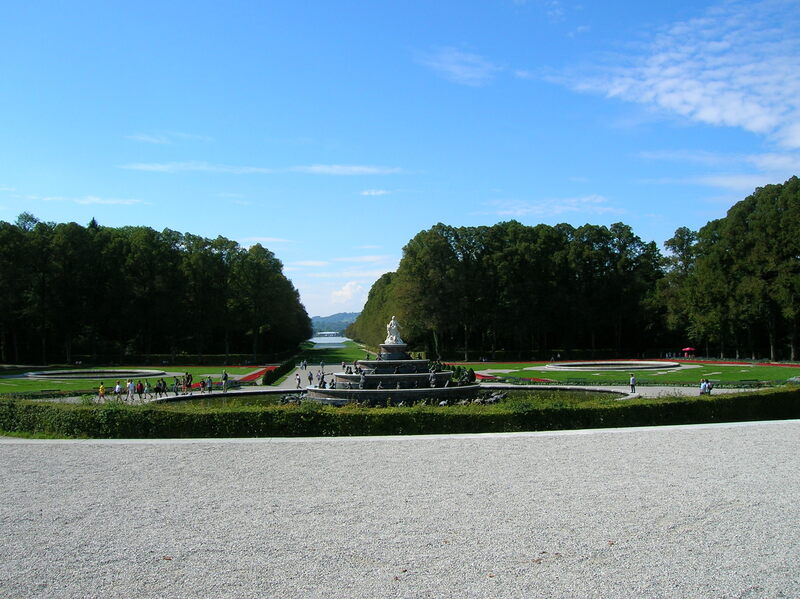 Overall, King Ludwig II had planned for there to be 70 rooms in the palace, but only 50 rooms had been completed. The king’s private entrance was unfinished, too. I could hardly imagine the grandeur that would have pervaded if King Ludwig II had been able to build all 70 spaces. 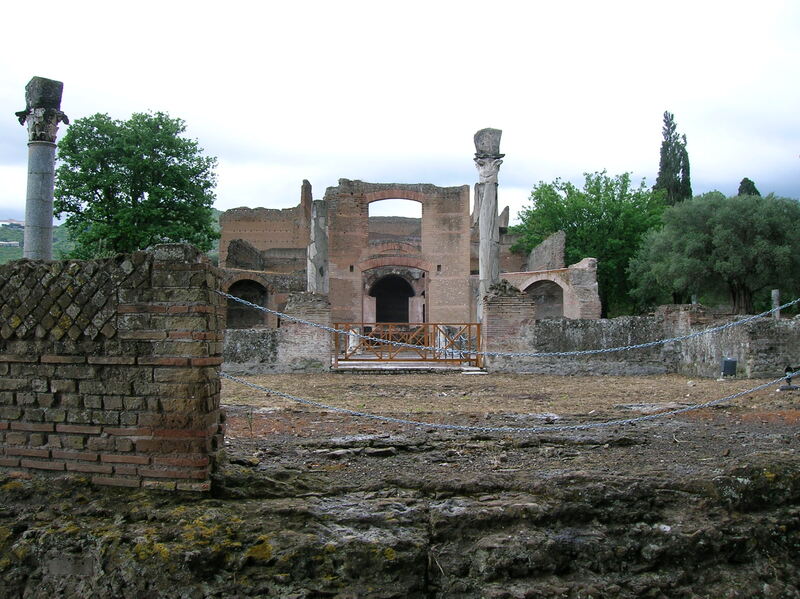 During the tour I thought back to my visit to Hadrian’s Villa in what is today Tivoli near Rome. 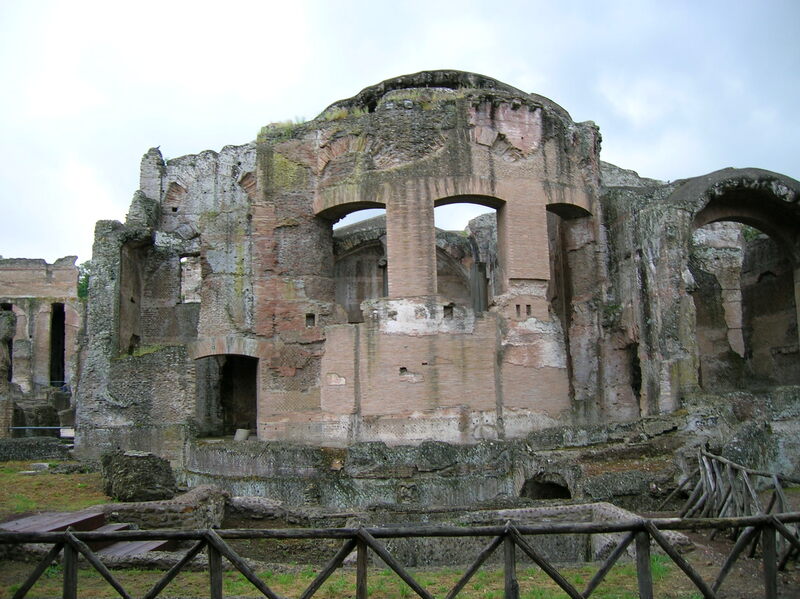 Emperor Hadrian’s immense villa had imitated places and locations around the empire that he had liked the most. For example, there was a copy of the Nile at its estuary, two Greek valleys, several Athenian sites. In total, there had been 30 buildings, including temples, palaces, a theatre and libraries. I thought about how the architecture reflected his inner turmoil and how Herrrenchiemsee, Neuschwanstein and Linderhof Palace reflected Ludwig II’s troubles. 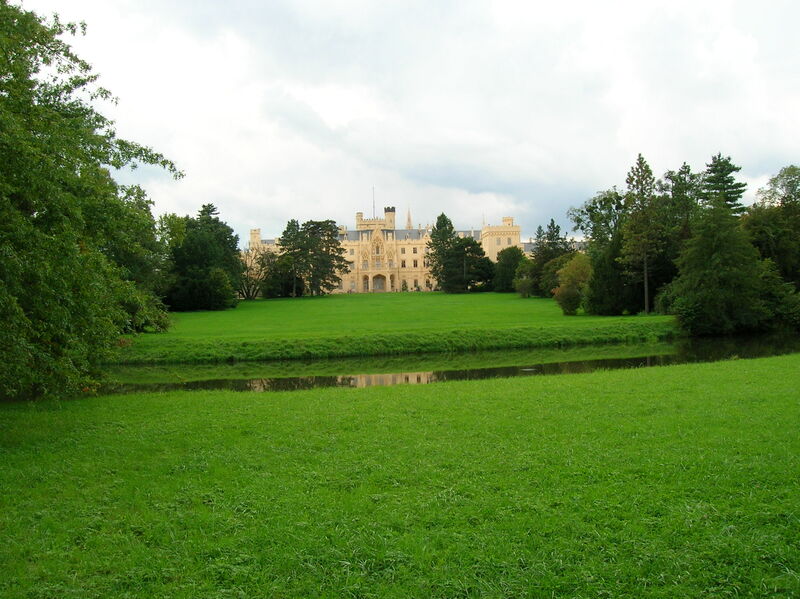 Next I visited the Ludwig II Museum in the palace. In this museum I saw some intriguing artifacts. I was impressed with the long, blood red with silver trim wedding robes made for King Ludwig II and Sophie, Duchess of Bavaria. I could imagine them clad in those lavish robes if they had actually got married. Ludwig’s death mask was on display, too. In the portrait of Ludwig as Grand Master of the Order of Knights of Saint George, the “mad” king looked devilish, angry even. Perhaps he had just been reminded that he would never have absolute rule in his kingdom. In the picture he was clutching a scabbard with one white-gloved hand. I also spotted a tiled stove in playful, cheery colors. 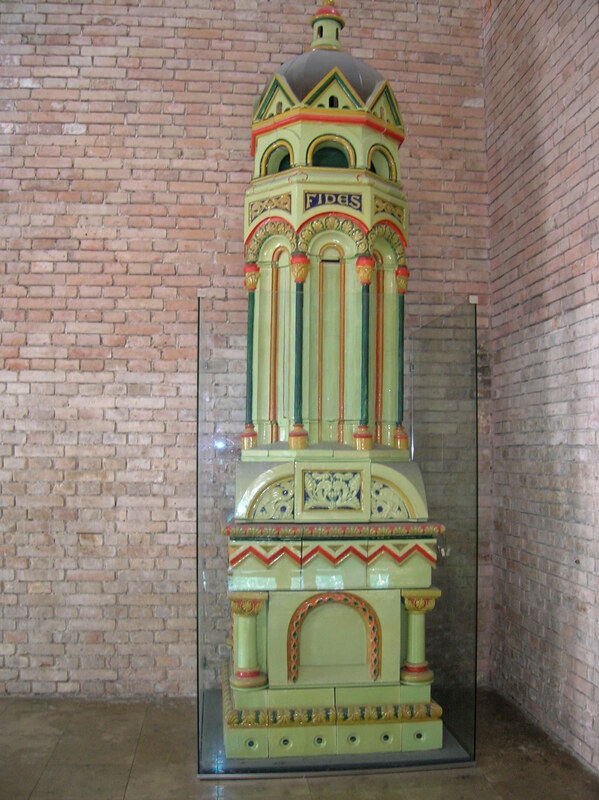 The stove was decorated in a mixture of green with yellow as well as gray with red and had been originally placed at Neuschwanstein, where I had set eyes on a similar tiled stove. I saw other ornate Meissen vases and sculpture as well. The models of stage sets exhibited Ludwig II’s passion for Richard Wagner’s music. In fact, there were many artifacts from Neuschwanstein and Linderhof Palace. 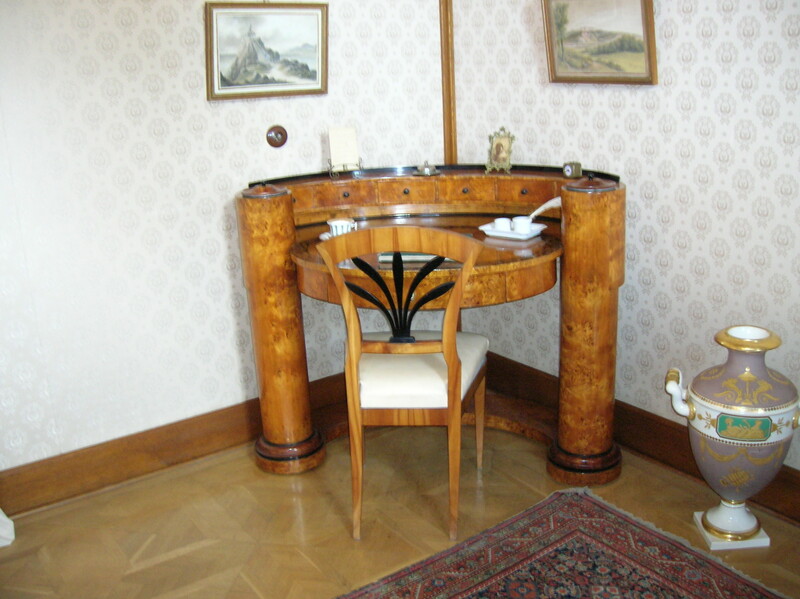 One room boasted the original furniture from a bedroom at Linderhof. The original boat from Ludwig II’s winter garden that had been situated on the roof of the Residence Palace in Munich was on display, too. Lastly, I visited the Old Palace – the Augustinian Monastery that was founded around 1125. The current monastery buildings dated from the Baroque period, though. The complex consisted of four wings with an almost rectangular courtyard and rose garden. Perhaps it was best known as the setting for the drafting of Germany’s new constitution in 1948, paving the way for Germany’s identity as a republic. Now there is a history museum dealing with the constitution on the premises, but all the placards were in German, so I did not understand it. My favorite room was covered in Baroque frescoes, an array of dynamic figures in bright colors. Another space was Ludwig II’s Study with intriguing furnishings. While it did not compare to the New Palace in grandeur, the Old Palace had a welcome sense of simplicity and a variety of objects and furnishings on display, not adhering to one, specific theme. I took a break and sat outside on that beautiful, sunny day and drank some water. There was no doubt about it. Herrenchiemsee was one of my favorite palaces (or castles, as it is often called) though I liked the romantic, 19th century Gothic style of Neuschwanstein even better. Herrenchiemsee definitely ranked up there with Czech castles and chateaus. I was overwhelmed by the beauty and elegance of the palace. I was very satisfied with the tour guide that led our group through numerous rooms. The articulate guide had spoken perfect English and had described each room with contagious enthusiasm. 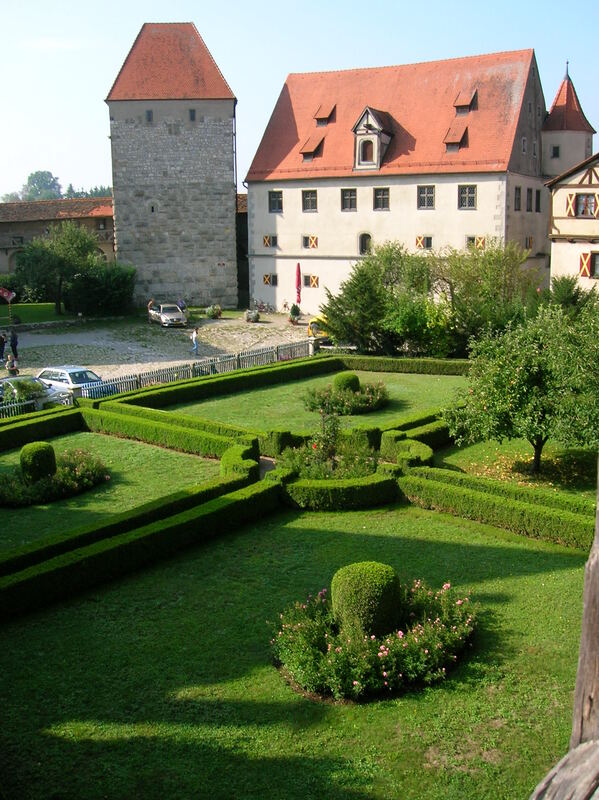 In fact, all the guides that had showed me Bavarian castles and palaces had been excellent, giving vivid descriptions and pointing out intriguing details. The garden was outstanding, too, with fountains and sculptural decoration that enthralled me. The parterre was stunning as well. I could sit on a bench in this garden all day and read a good book, often gazing around me at the remarkable, calming scenery. 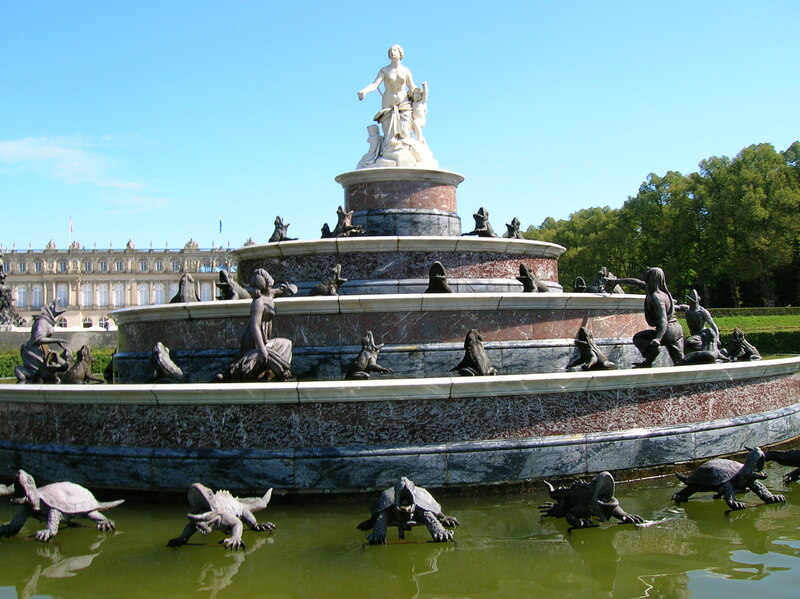 I loved those tortoises and frog figures on the Latona Fountain most of all. 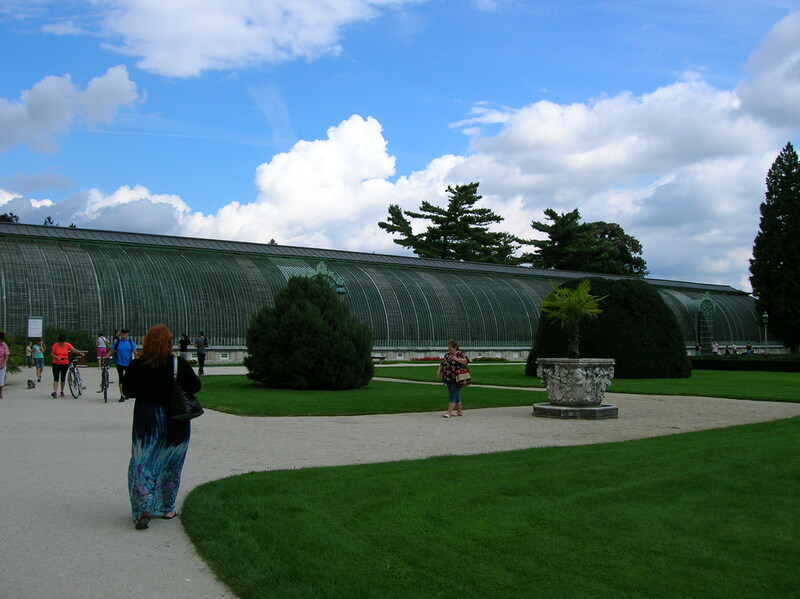 The magic of Herrenchiemsee would stay in my mind forever. Versailles had been so crowded when I visited some years ago on one unusually warm February day. It had not been possible to soak up the atmosphere with a throng of tourists elbowing me for positions to take the best photo. During the tour of Herrenchiemsee, I was able to appreciate the elegance of the rooms without fighting my way through crowds as there was only a fixed number of people allowed on each tour. The mysterious circumstances of Ludwig II’s death came to my mind as we waited for a boat to take us back to the bus. On trial on June 8, 1886, the king was declared mentally ill and legally incompetent to rule. The statements for his defense were not taken into consideration. His death was mysterious. It seemed to jump out of a Sherlock Holmes whodunit. Five days after hearing the verdict, Ludwig took a walk with his doctor. He did not have any of his guards accompany them. What happened next? Nobody knows. Later both bodies were found in the water. The mystery may never be solved as the Wittelsbach clan will not allow Ludwig II’s corpse to be exhumed. While I was staying in Munich, I went on a Gray Line tour of Harburg Castle, a medieval Bavarian gem and then on to Rothenburg ob der Tauber, one of the most picturesque towns in the world. 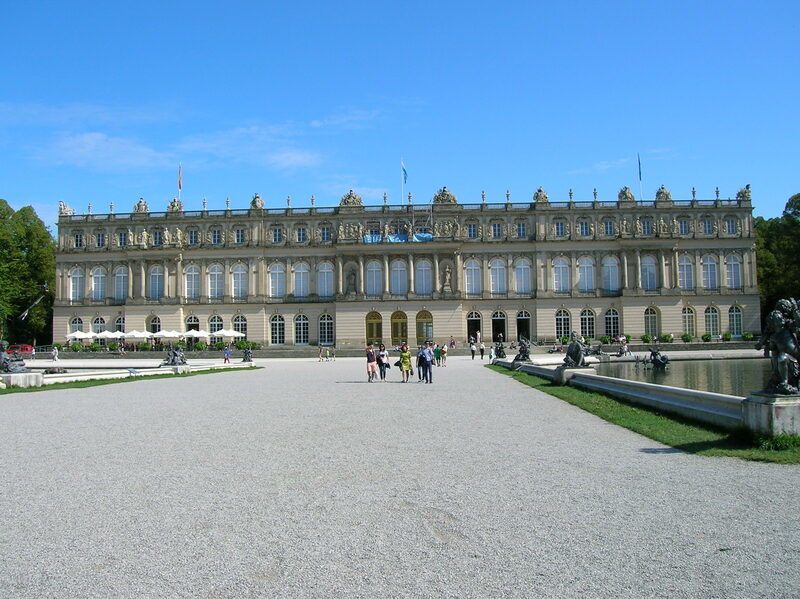 I had been very satisfied with the Gray Line Munich tour I had taken to Palace Linderhof and Neuschwanstein Castle some months earlier. 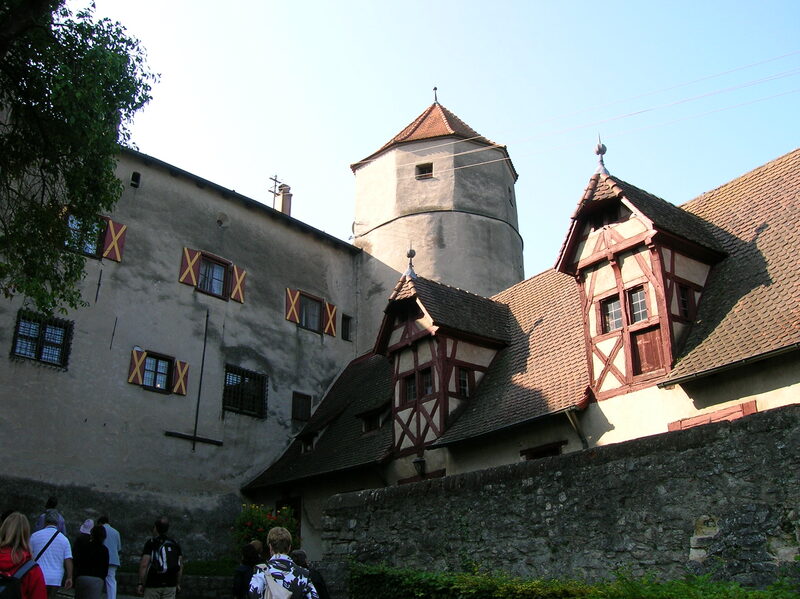 Harburg Castle is one of the best preserved, oldest and largest castles in south Germany. In addition to the rooms open to the public, it houses the archives of the Oettingen-Wallerstein branch of the family that took control of the property in 1731. Spanning the 11th to 18th centuries, an art collection is on the premises, too, but unfortunately is not open to the public. 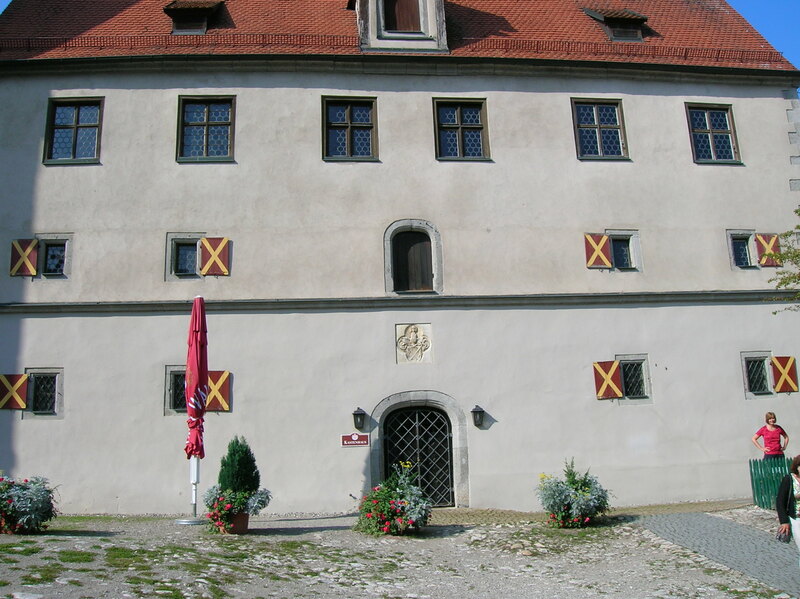 Harburg Castle dates from the 11th century. It was first mentioned in writing during 1150. Standing on the grounds, you can feel its history. Death penalties were carried out here, and bloody battles were fought here. 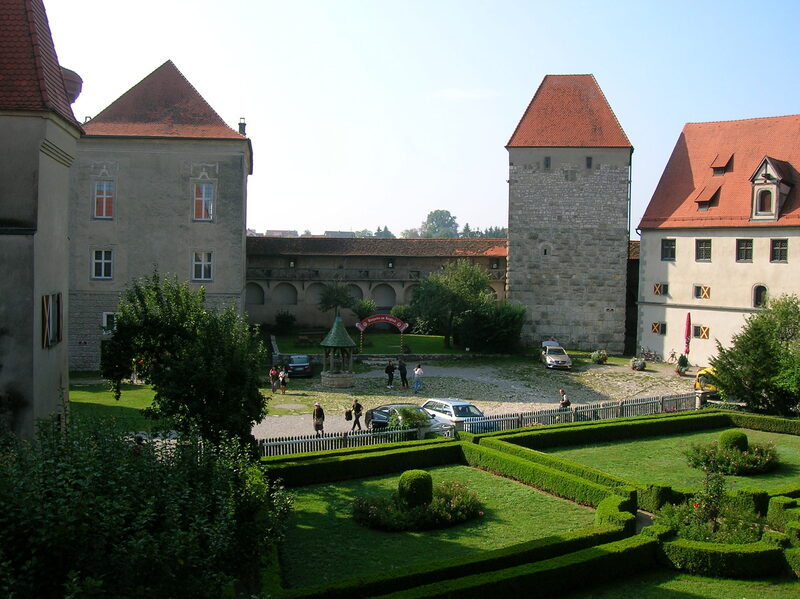 The Oettingen Princes owned the castle for some 700 years. The Prince’s Building even goes back to the first half of the 10th century, where the archives are now located. The two towers were first mentioned in writing during 1150 but are actually much older, dating from 600 or 700 AD. The portcullis was built in 1752. Nailed behind it is the skull of a wolf, the last wolf ever shot in the region. The granary served judicial purposes from 1806 to 1852. 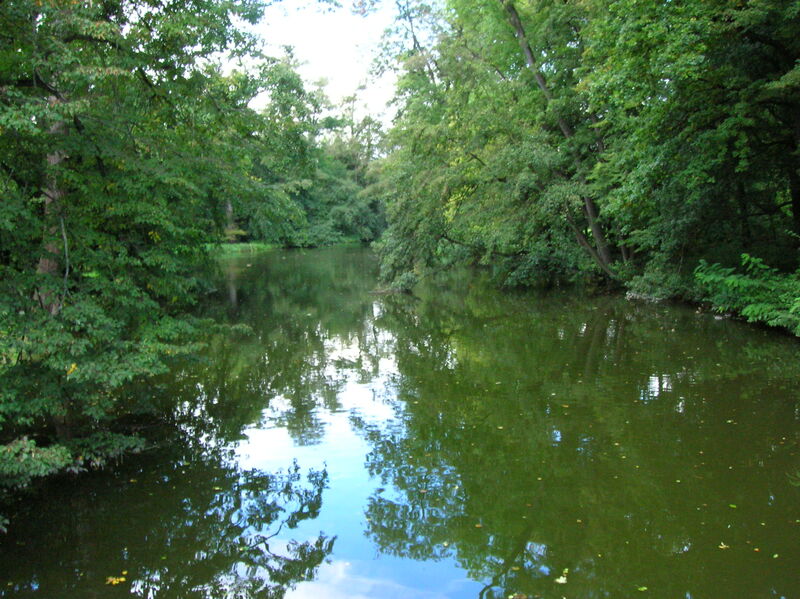 A significant part of Harburg’s history began when Ludwig III von Oettingen gained Harburg in 1251. The Oettingens made the castle their home after 1418. The clan made a name for itself in the military and in politics. Construction of a two-storey hall took place in the late 15th century. In the early 16th century the Oettingens took up the Protestant faith as the Reformation greatly influenced the history of the castle. The Schmalkaldic War, pitting the Catholic Habsburgs against the Protestants in their Lutheran Schmalkaldic League within the Holy Roman Empire, was fought from 1546 to 1547. The Imperial troops won, triggering devastation for the castle during 1547. Still, the teachings of Martin Luther had already spread throughout the lands and could not be stopped by force. Things did not fare as badly during the Thirty Years’ War, when it was not heavily damaged, though the area was in ruins. The Oettingen-Oettingen line of the family were elevated to princes during 1674. There was much reconstruction in the 17th century. Pillaging occurred during the Spanish War of Succession from 1701 to 1704. The castle soon rebounded, though. More repairs were carried out in the early 18th century. That’s when the Banquet Hall was built and the church was given a Baroque appearance. In 1731 the Protestant line of the family ended, and the Catholic branch the Oettingen-Wallerstein line took charge. During the War of the Second Coalition, which was fought between the Austrians and Napoleon’s armies, much pillaging took place. In 1797 a military hospital was located on the premises. 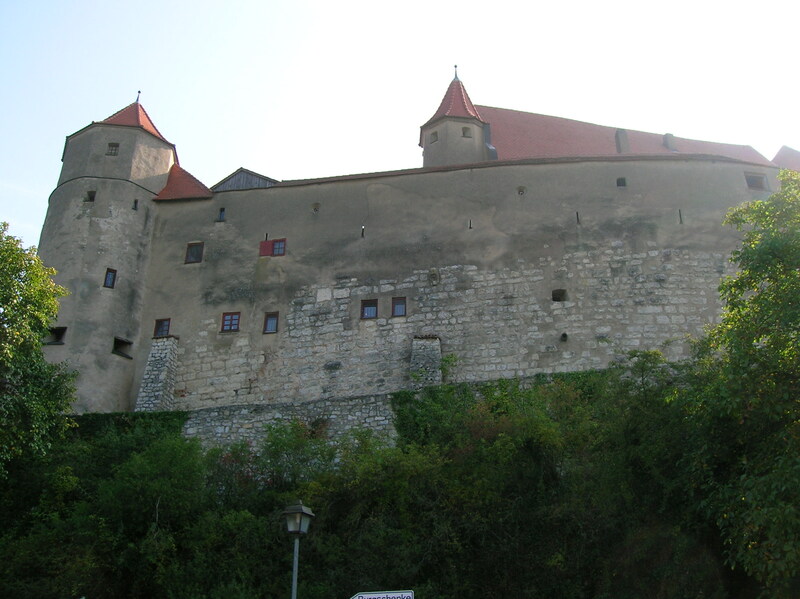 The Austrians were unable to protect the castle on June 24, 1800, when Napoleon’s troops captured the decisive victory. Even though there was much damage, that day is now celebrated at the castle as it was a blessing in disguise. Under French rule the 18th century was a time of imperial visits and reconstruction. Kaiser Franz II, the last Kaiser of the Holy Roman Empire of the German Nation paid it a visit in 1766. Napoleon even rode by the castle in a carriage during October of 1805. We did not go inside the Castle Church of Saint Michael’s, but I read that its Baroque interior hails from 1720 and 1721. A Baroque pulpit and ceiling frescoes are a few of the highlights of this church. The tomb of the Oettingen-Oettingen line of the family has been under the pulpit since the 16th century. The church is still used for services. Now the church’s denomination is Lutheran. Take a good look at the well that is 450 meters deep. It took an hour to get water from its depths to the ground. The castle featured many intriguing devices used during wartime. One loophole in its side was situated so that the defender could throw hot water on the enemy and burn him. Quicklime was often used, so that the opponent would go blind immediately. Another window in the wall had a beam to which a soldier could hook his weapon. Then there was a loophole that consisted of a wooden wall within a wall. It could swivel around so you could see in all directions. The hole was too small to be seen by the enemy. We went inside and saw many richly decorated shields. Because people could not read or write, symbols of various clans decorated the shields. One featured the color red for blood and a yellow X for money. Three more showed a donkey, two wheels and a wooden shoe, which reminded me of an advertisement for L.L. Bean. A black shield with a red cow head symbolized the family of Cow Mouth, which would certainly not be a popular name in today’s world. Then we entered a room that featured a stunning chair that was 500 years old, symbolizing that the person who would sit in it was very powerful. 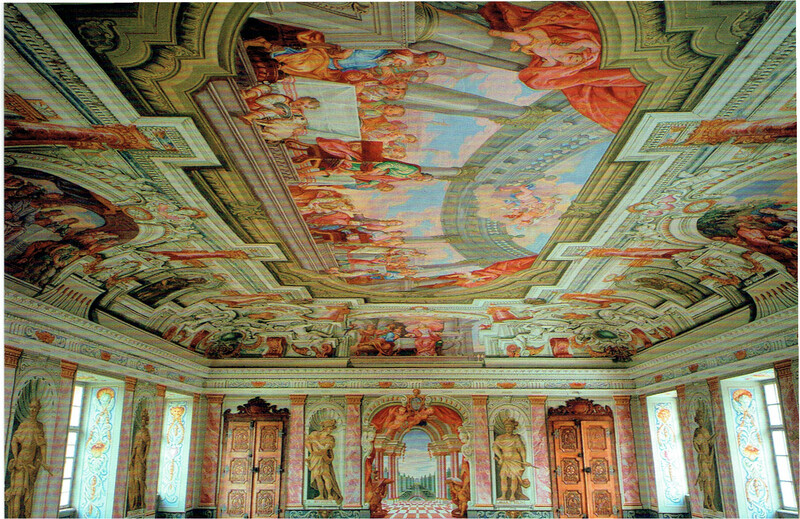 The richly decorated ceiling was made for another castle in Italy in 1750, and the princely family bought it in 1920. The Habsburg clan is not missing from the castle, either. (They seem to be present in all the castles I visit.) Decoration of ladies’ portraits in circular frames showed off females from this distinguished clan. The two family trees also caught my attention. One dated from the 17th century and was painted on linen. The other dated from the 18th century and was painted on cow skin. That one was made with one hair of a pig. I could not believe it was possible to design a family tree with one hair. What exquisite craftsmanship! I thought of my own family tree and how many questions it posed. If only I had all my ancestors accounted for as the Oettingens did on theirs. From where exactly in Bohemia were my Czech great grandparents? 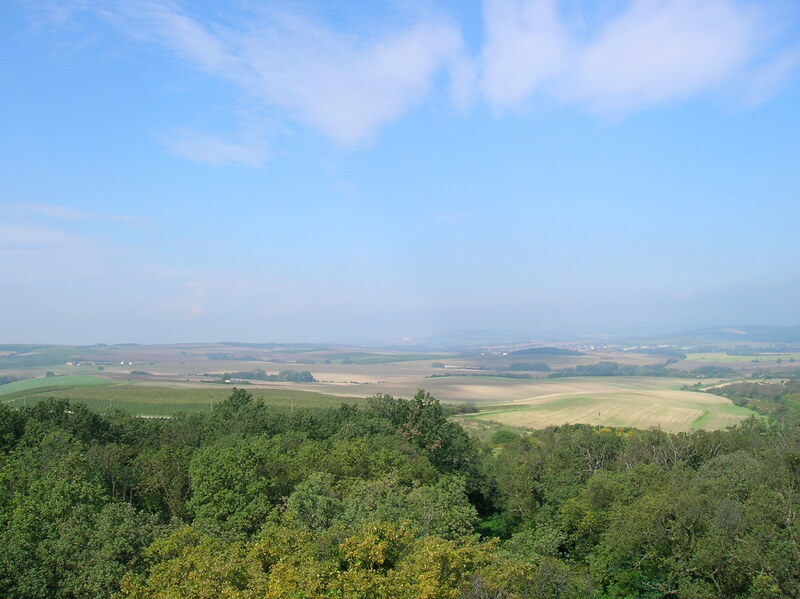 Who exactly were my Mareš ancestors, and from where in Moravia were they? Situated in many castles, life-size portraits also decorated the room. I recognized Charlemagne. The next room was in front of the first keep. Each wall was 2.5 meters thick, and below each wall it was three meters thick. The inside room was 9 meters deep. Because it was so cool there, it was possible to use it as a sort of refrigerator. A man went down to the fridge with a rope around his stomach and brought the food up. A dungeon was also below us. There’s no way I would want to be stuck down there. Other spaces featured weapons and hunting trophies. A beam was 1,000 years old while a middle pillar was 800 years old. A clock had a 24-hour face. I was intrigued by the tour but disappointed that it was so short. It would have been nice to have seen at least four or five more rooms. The castle had such a fascinating medieval flair and some stunning objects, but people only got a glimpse of its character. Still, the castle was architecturally intriguing on the exterior and interior. It was worth visiting if you are combining it with a day trip somewhere else. It proved an excellent stop on the way to Rothenburg ob der Tauber. Still, I considered Karlštejn Castle, Křivoklát Castle and Pernštejn Castle in the Czech Republic to be superior because you were able to take extensive tours and get a real sense of their medieval character. On the way to Rothenburg, our tour guide, an eloquent, friendly woman, told us that Michael Jackson at one time had tried to buy Harburg for 25 million euros. At the last moment, though, the deal fell through. I, for one, was glad. Who knows if he would have opened it to the public at all? While I was visiting Neo-Gothic Lednice Chateau in south Moravia, I explored the greenhouse, which was finished in 1845, restored in 1996 and renovated again in 2002. It still retained its early 20th century appearance. 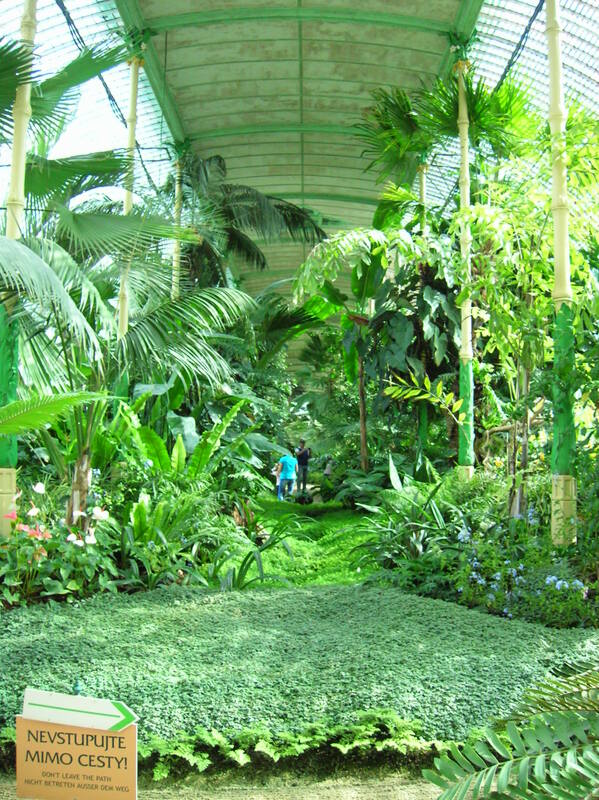 The greenhouse was 92.6 meters long and 13.6 meters wide. 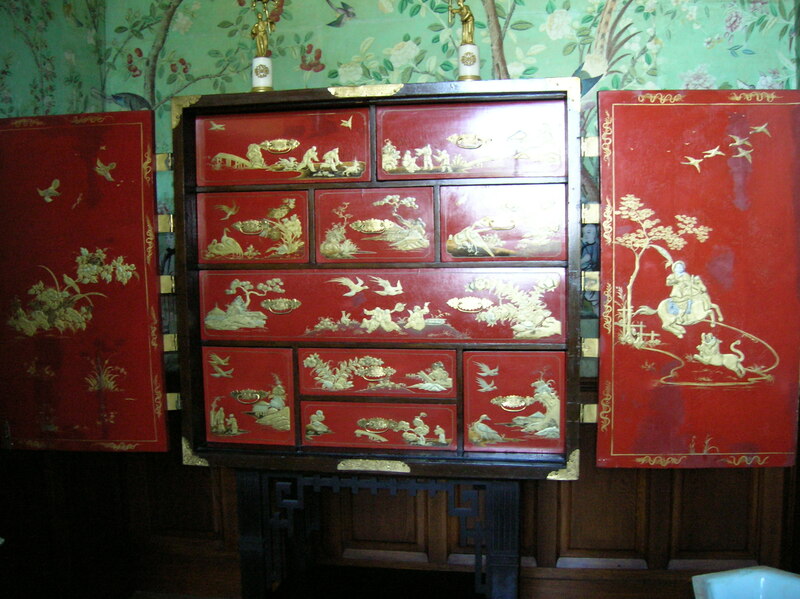 Its decoration included 44 pillars showing off a bamboo motif. 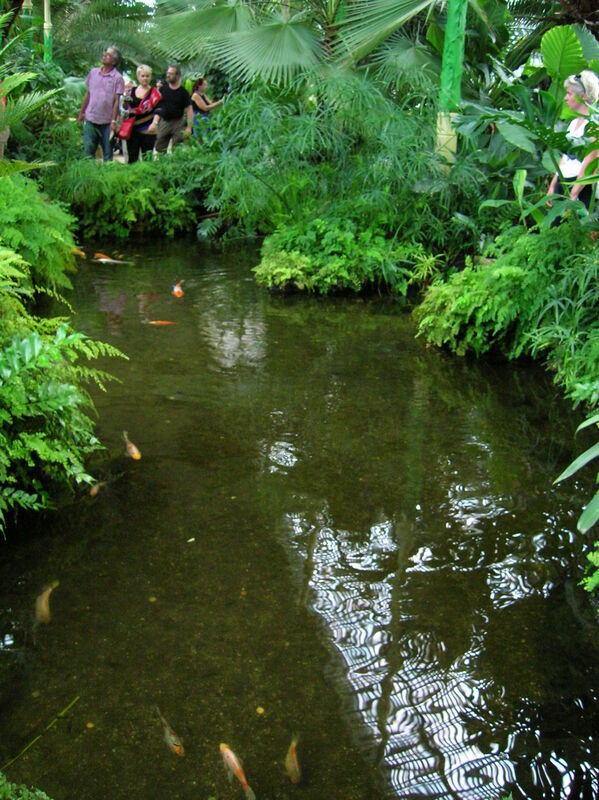 An elliptical pond was one of the highlights. 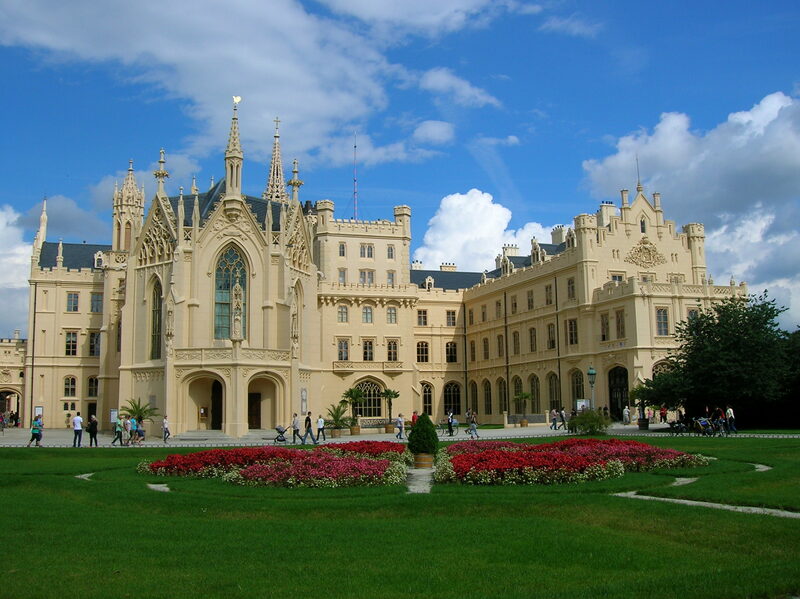 Lednice Chateau in south Moravia has always been one of my favorites because I love Neo-Gothic architecture. Just gazing at the exterior takes my breath away. The interior does not disappoint, either. I was visiting the chateau for the third time. Usually I came alone, but now I was with the arsviva travel agency with whom I had taken tours throughout the Czech Republic and abroad. I had never had time to visit the magnificent park as I was always hurrying to nearby Valtice Chateau to see two chateaus in one day. Now I would not be so rushed. I could enjoy my visit without worrying about catching the bus to Valtice. I already knew something about the chateau’s background. 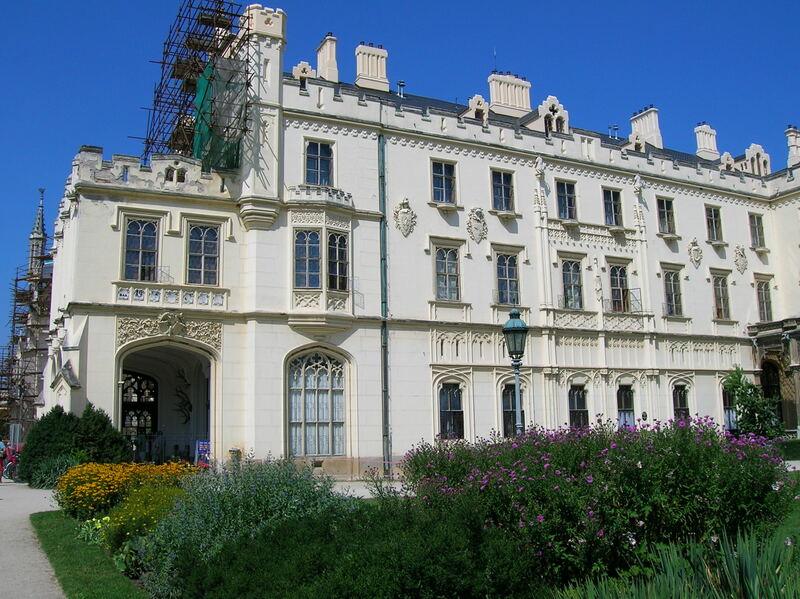 Lednice was first mentioned in writing as a Gothic fort in 1222. At the end of that century, the Liechtensteins took over Lednice, and they would hold on to it until 1945, for some 700 years. The Liechtensteins would make Lednice their summer residence. 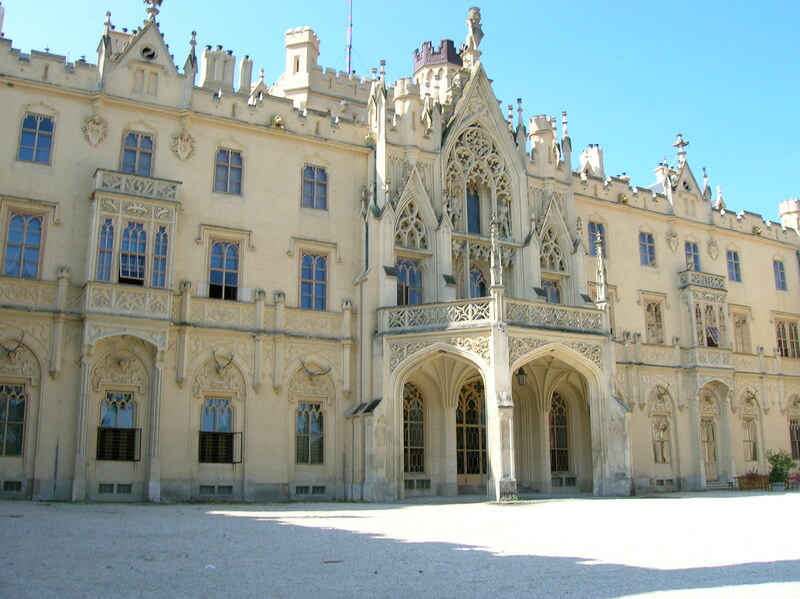 Lednice was transformed into a Renaissance chateau during the 16th century. In the following century, when the Czech Protestant nobles revolted against the Catholic Habsburgs, the Liechtensteins took a Catholic stance. Because they supported the Catholics, the chateau remained their property after the Protestants were defeated. The following years proved to be a golden era for the wealthy family. Lednice was turned into a Baroque masterpiece during the 17th century. 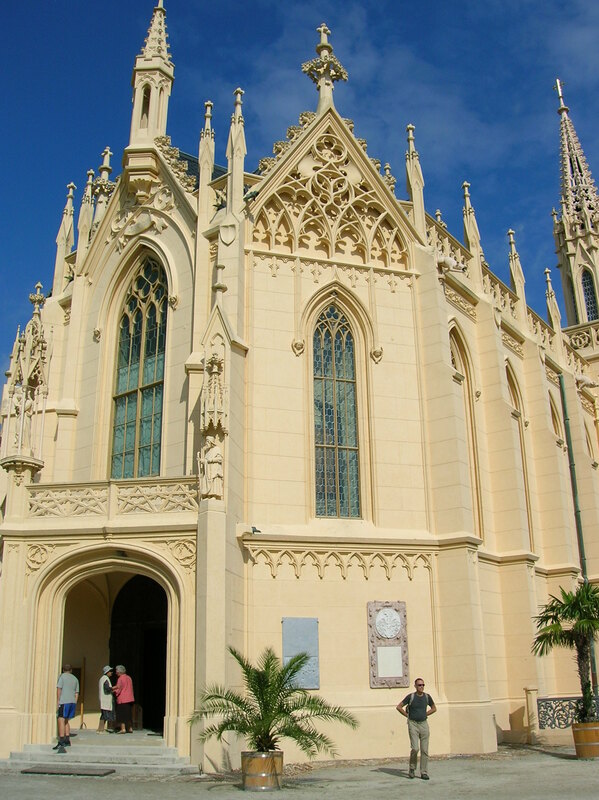 It got its Neo-Gothic appearance, inspired by English Gothic architecture, from 1846 to 1858. Fortunately, the family was able to remove most of the furnishings during World War II, so visitors can see much of the original décor today. 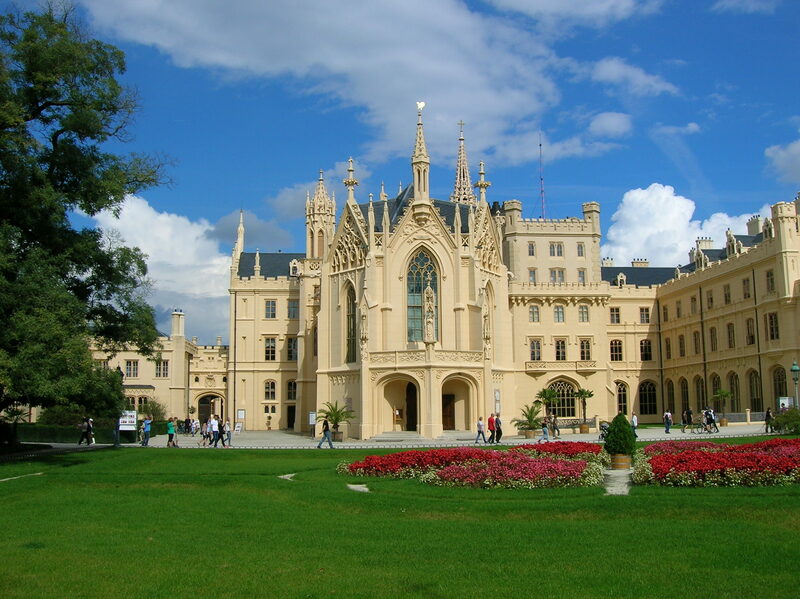 The Lednice and Valtice area was added to the UNESCO List of World Cultural and Natural Heritage sites in 1996. I had been on all tours of the interior, but this time our visit would focus on the representative rooms, which was my favorite tour. The other tour of the rooms concentrated on the princely apartments. There were also four tours of the park plus two others. We would see the park on one hour-long tour. In the hallway we saw the biggest chandelier in the Czech Republic, made in Vienna. It had 116 arms and weighed 690 kilos. 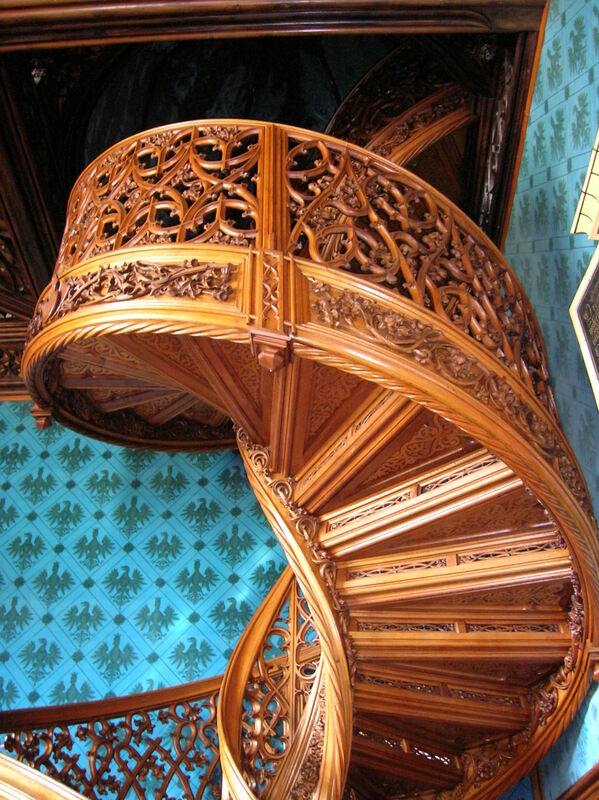 I also noticed the richly carved wooden staircase and banister, though I knew an even more impressive staircase awaited me. 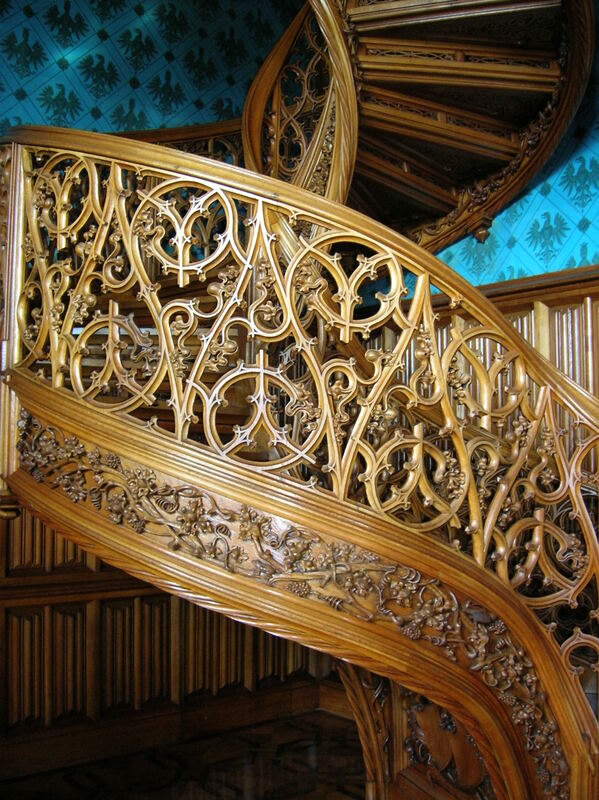 What I loved most about Lednice was its richly carved woodwork, the most impressive woodcarving in the country, in my opinion. It never failed to astound me. I could stare at it for hours. I was impressed by the Viennese porcelain in the Ladies’ Salon. In the Empire style Ladies’ Bedroom a 19th century Mexican cross captivated me. It was so exquisitely and richly decorated with such amazing detail. A splendid desk also took my breath away. The small Chinese Rooms were two of my favorite spaces in the chateau. The wallpaper of the Oriental Salon was hand-painted, made with Chinese paper during the beginning of the 18th century. 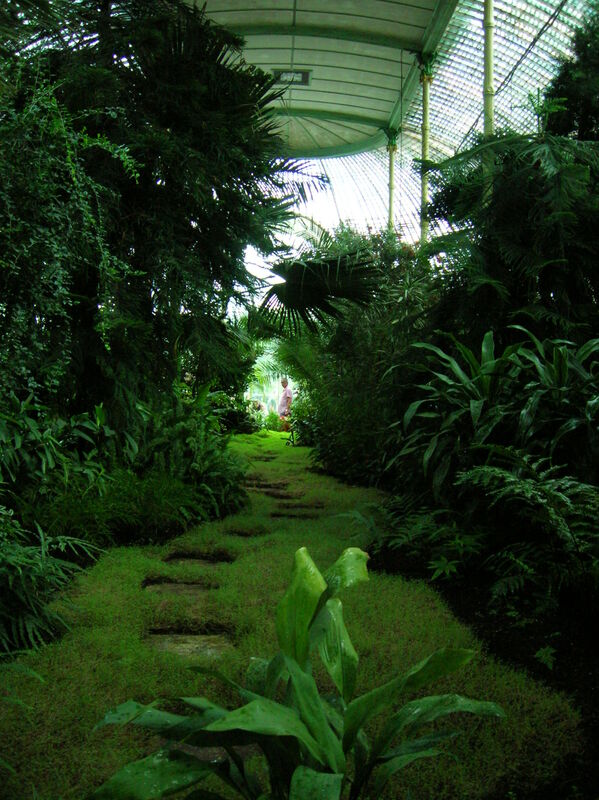 It featured an idyllic landscape with figures in a vibrant green color. Another space showed off medieval ceiling vaulting and richly carved wood paneling. I found the wood paneling to be comforting. It somehow made me feel safe, as if I were in a place where I could temporarily forget all my worries. I was so awed by the detail of the paneling decoration throughout the chateau. The view was idyllic, too. The room looked out on the garden and a pond. I would explore the park soon. I was psyched. The Big Summer Dining Room showed off a Gothic table with pewter dishes. 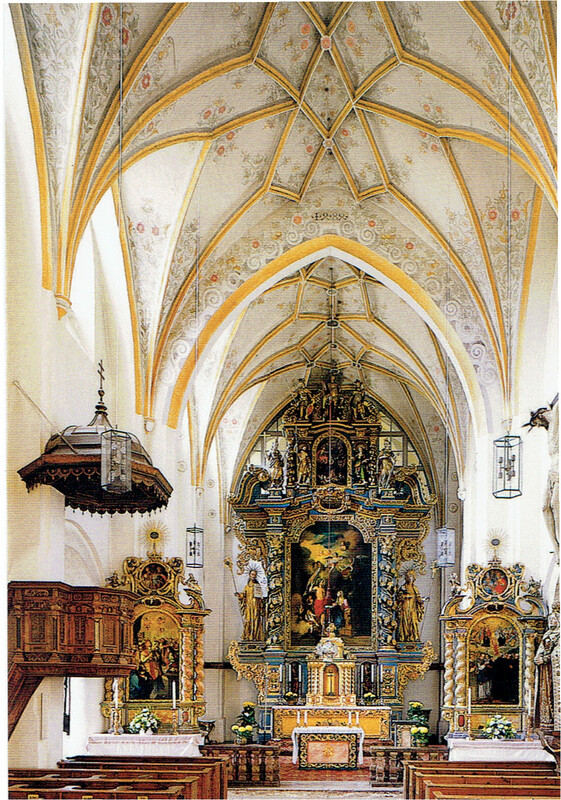 The vaulting was Neo-Gothic, influenced by the Gothic style. Then came my favorite room, the library. A voracious reader, I have always felt comfortable in libraries, but this one was extra special due to its richly carved oak, self-supporting, spiral staircase, the most exquisite example of richly carved wood I had ever seen. The architectural wonder was created in 1850. 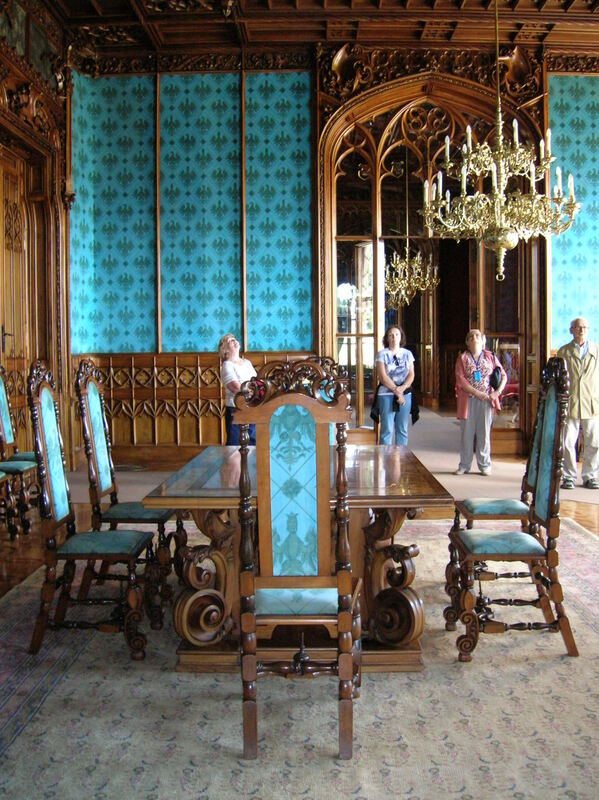 The rich blue furnishings and matching blue wallpaper complemented the wood ornamentation perfectly. Even the door boasted an intricate wood design. The library itself held about 2,000 volumes, including many books about architecture, art and travel. The astounding ceiling was made of oak. A 16th century Italian altar showed the genealogy tree of Jesus Christ. I loved the wallpaper throughout the chateau, but my favorite was the turquoise with green wallpaper in the Turquoise Hall. The wood furnishings were made from Canadian walnut wood. A copy of a painting by Raphael added to the charm as did an 18th century Chinese vase. Those Neo-Gothic chairs with detailed designs on the backs captivated me not only in this room but also throughout the chateau. The Red Salon or Smoking Salon boasted wallpaper the color of red wine. Coats-of-arms décor was situated high on the walls. Its chandeliers were splendid, too. The Blue Hall was the biggest space in the chateau with crystal candelabras and a ceiling made from linden wood in Neo-Gothic style. I loved the wood ceilings in this chateau, this one especially. This ceiling was extra special because every motif on it was original – no motif was repeated. That made it one of the most impressive ceilings I had seen in chateaus in this country. After touring the interior, it was time to explore the park. 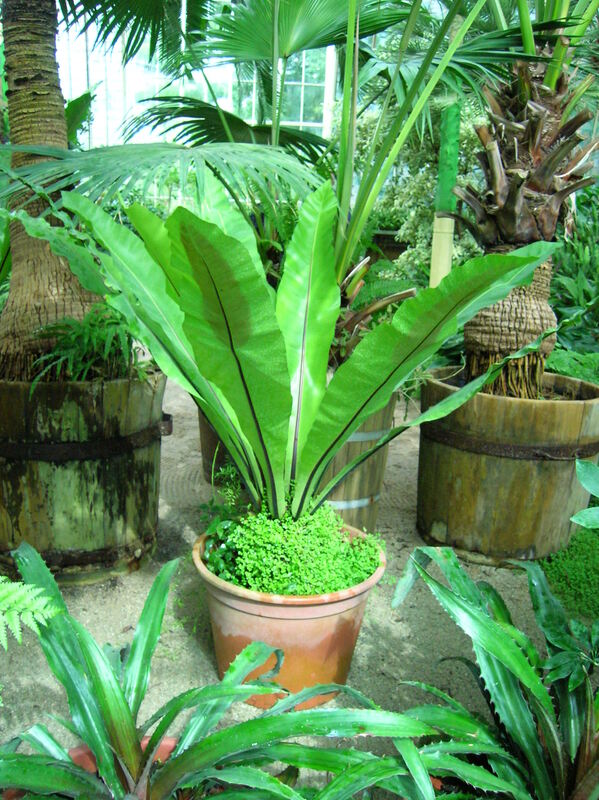 First, though, I went into the greenhouse to see all the stunning plants. 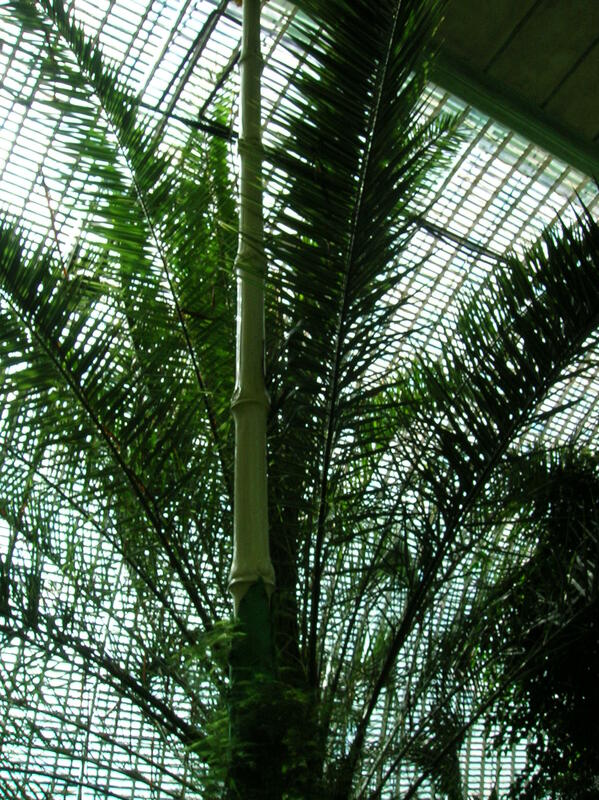 The greenhouse was finished in 1845, restored in 1996 and renovated again in 2002. Yet it retained its early 20th century appearance. It was 92.6 meters long and 13.6 meters wide. Its decoration included 44 pillars showing off a bamboo motif. 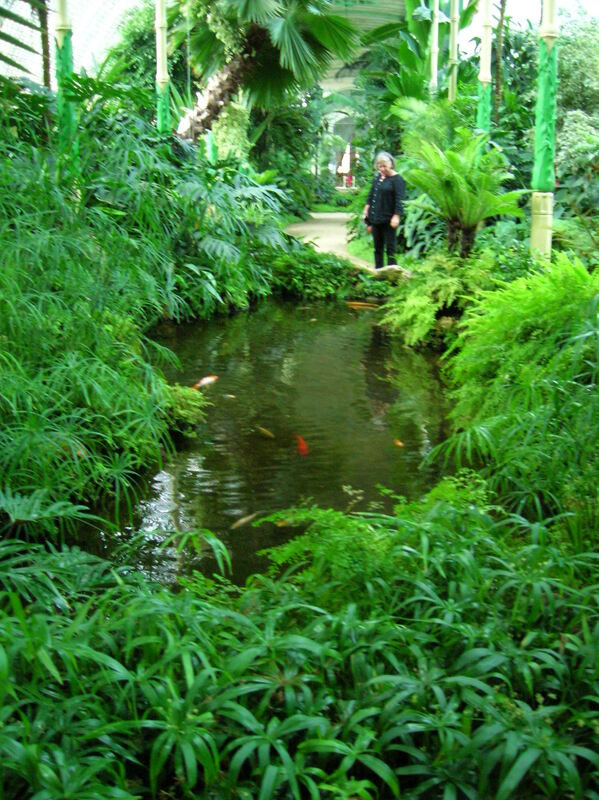 An elliptical pond was one of the highlights. Next we visited the park made up of the natural park and the regular garden. 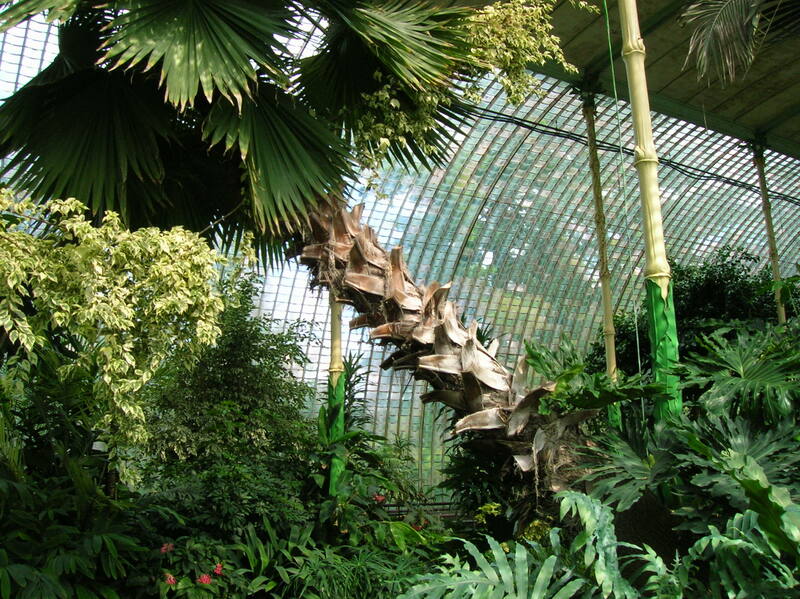 More than 600 types of woody plants now appear in the park. 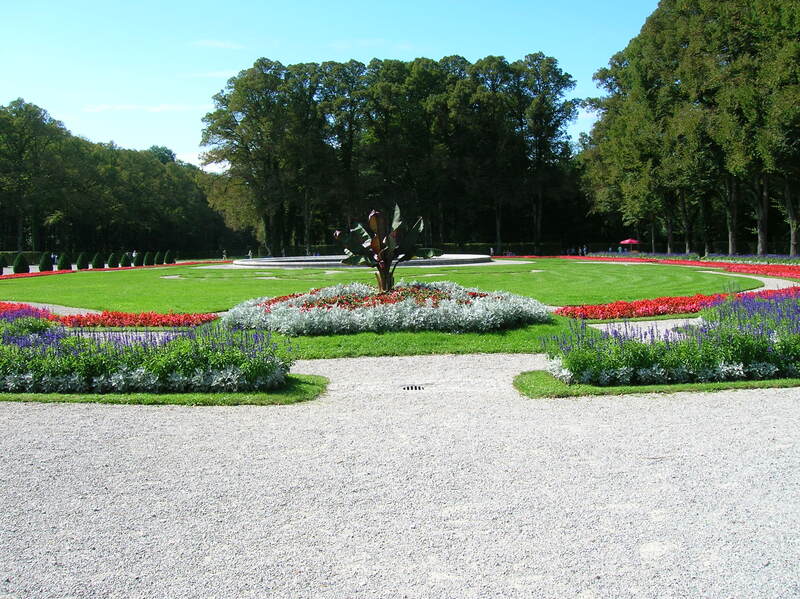 The park harkens back to the 16th century when Lednice was a Renaissance chateau. At the turn of the 18th and 19th centuries, the park took on a Baroque and Classicist look. 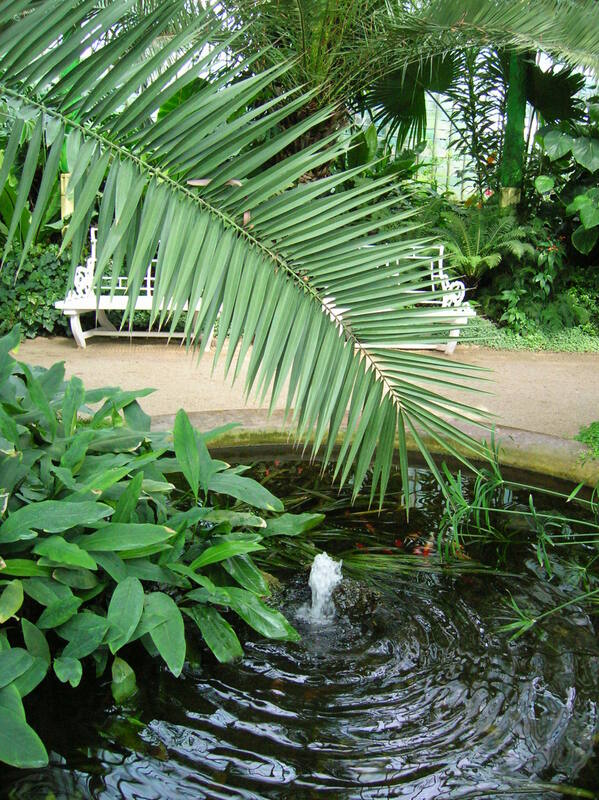 At the end of the 18th century, exotic plants were added to the park, which has been open to the public since the end of the 18th century. A Chinese pavilion was added by Austrian architect Josef Hardtmuth in 1795, when the park was expanded. Hardtmuth had served as the prince’s court builder and architect for the Liechtenstein family. 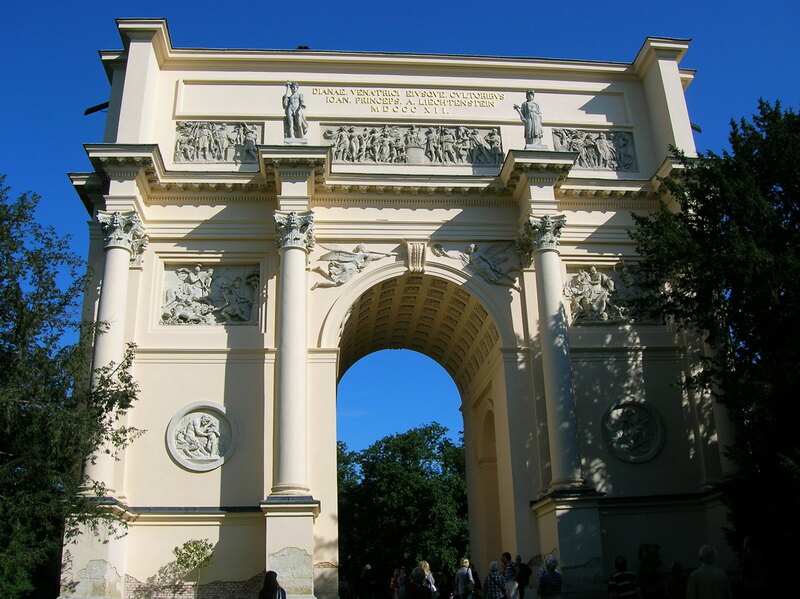 He was responsible for the design of many objects in the Lednice – Valtice area. But architecture was not Hardtmuth’s only talent – he also was a skilled inventor, and he came up with the idea of the modern pencil. He even founded a pencil manufacturing company in the late 18th century. We gazed across a pond to the Minaret, which was under reconstruction at that time, so there was scaffolding on the lower levels. Built between 1797 and 1804, the Minaret featured a pseudo-Oriental style. It was designed by Hardtmuth as well, and he received much acclaim for his design. 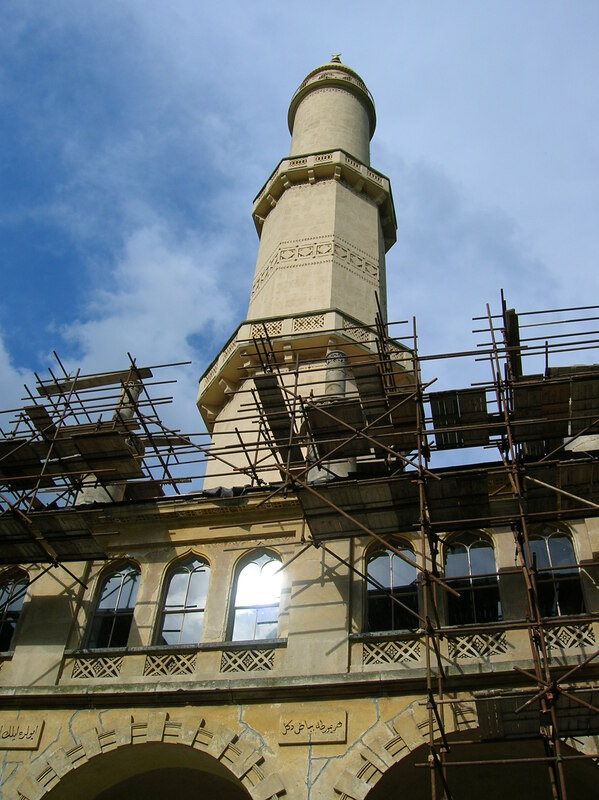 The Minaret was under renovation during my visit. Architecturally, the Minaret was composed of a square ground plan that opened with triple axial arcades on the ground floor. The upper floor consisted of eight rooms. The tower was three storeys high, measuring about 60 meters. The Minaret was crowned by a helmet with a half moon. 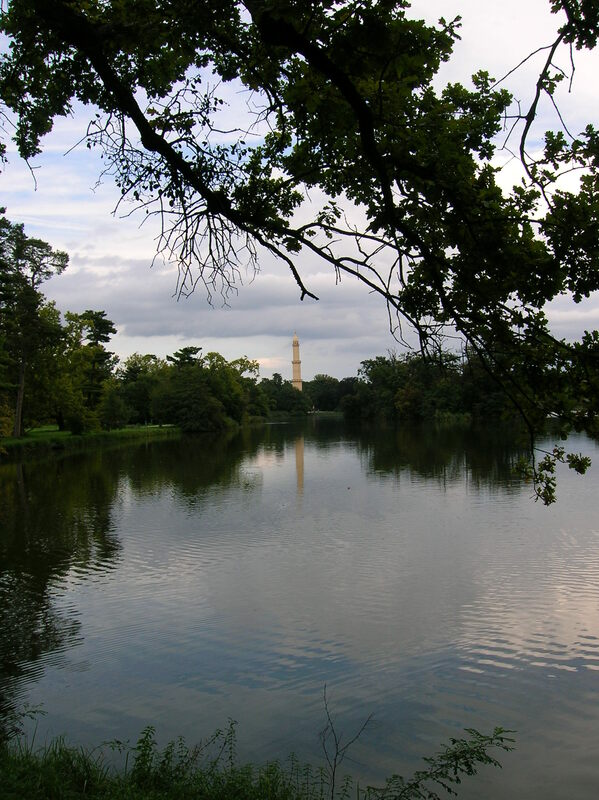 Now the Minaret is the only structure that dates back to the Baroque and Classicist appearance of the park. I wish we had been able to climb to the highest gallery, where it is said that one can see St. Stephen’s Cathedral in Vienna. 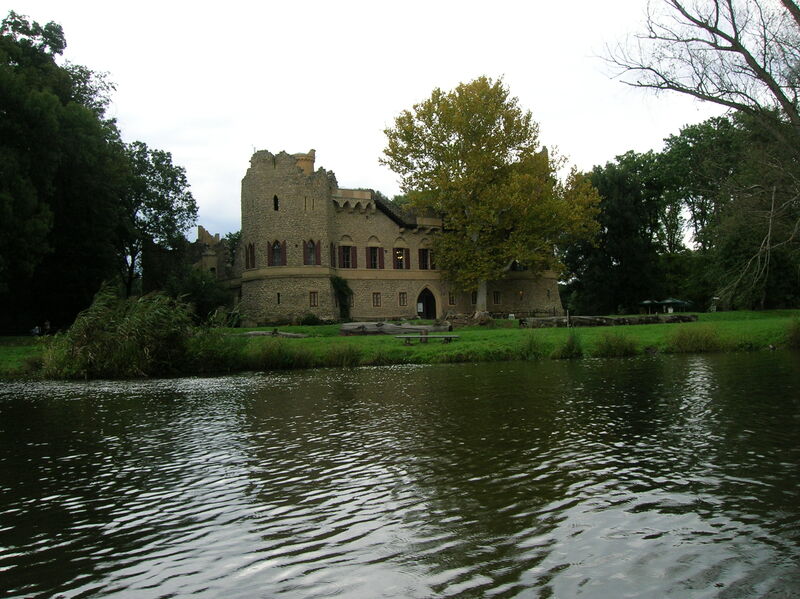 Then we took a rickety boat ride to Jan’s Castle, a 19th century copy of Romantic castle ruins created on the banks of the River Dyje, according to Hardtmuth’s design. Inspired by Gothic architecture, it had four wings and three gates. The Knights’ Hall was on the first floor, and banquets had been held there. The southern tower had two floors with a balcony. It exemplified the transition from Classical Romanticism to Early Romanticism that was popular in the 19th century. The castle looked like something out of a Gothic novel. The book Valerie and her Week of Wonders by Vítězslav Nezval came to mind. 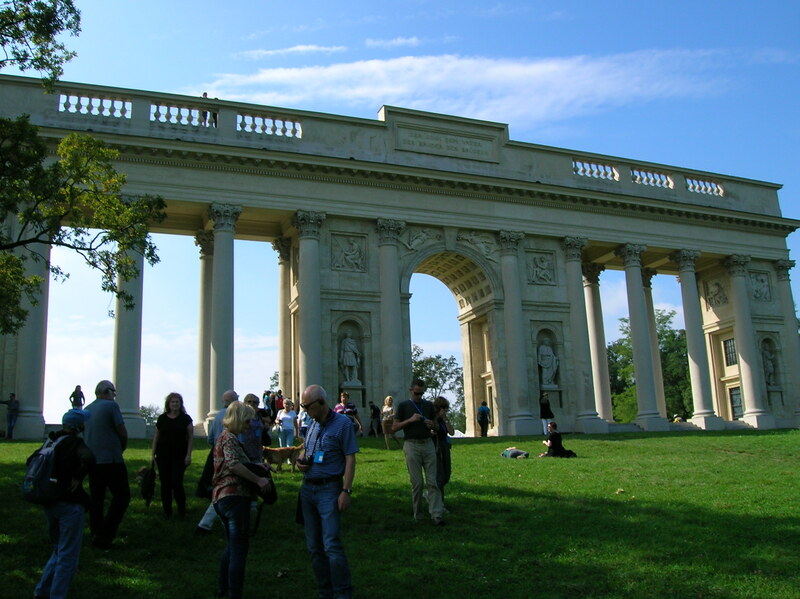 We saw other structures in the Lednice – Valtice area as well. The Border Chateau, created from 1826 to 1827, was situated near the historical border between Austria and the Czech Republic. 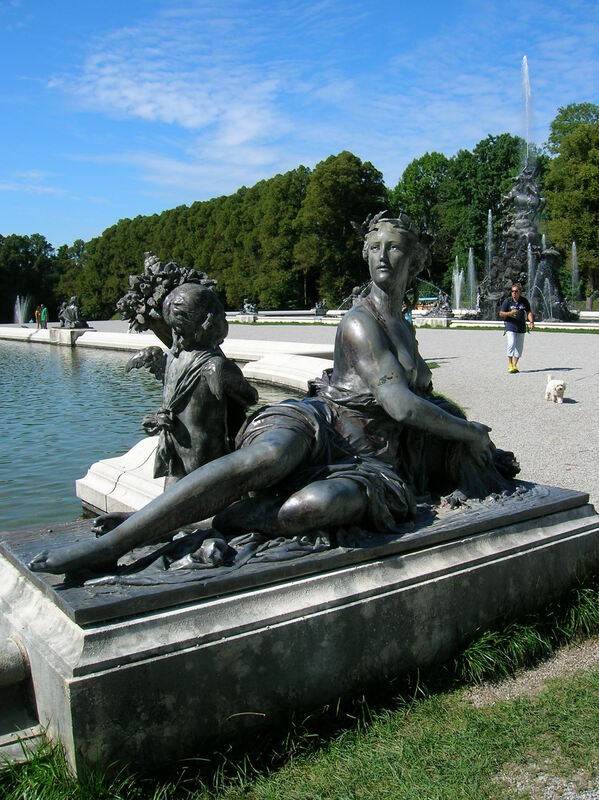 The historical border of the two countries was a brook that flowed through the vase of a sculpture of a reclining nymph. Then it went under the chateau and into a nearby pond. It was inspired by Palladian architecture, a style inspired by the designs of 16th century Italian architect Andrea Palladio. The Venice native had focused on symmetry and the characteristics of the formal classical temple from the architecture of the Greeks and Romans in antiquity. This style was often used in the 17th and 18th centuries. The inside of the chateau featured some Cubist style rooms. The pavilions were connected to wings with a terrace offering spectacular views. It was so harmonious with the nature that surrounded it. Architecturally, it seemed to respect its natural surroundings. Inspired by architecture from Roman and Greek antiquity, this Classicist structure was built from 1810 to 1823 by Hardtmuth and Josef Kornhäusel. The sculptural decoration, designed by Josef Klieber, showed off motifs of triumph and meditation. Reliefs portrayed the allegories of science, art and work. The figures in Roman togas represented the Liechtenstein nobles. The roof terrace offered spectacular views of three countries –the Czech Republic (specifically Moravia), Austria and Slovakia. The Classicist Diana’s Temple, created from 1810 to 1813 by Hardtmuth, also greatly impressed me. 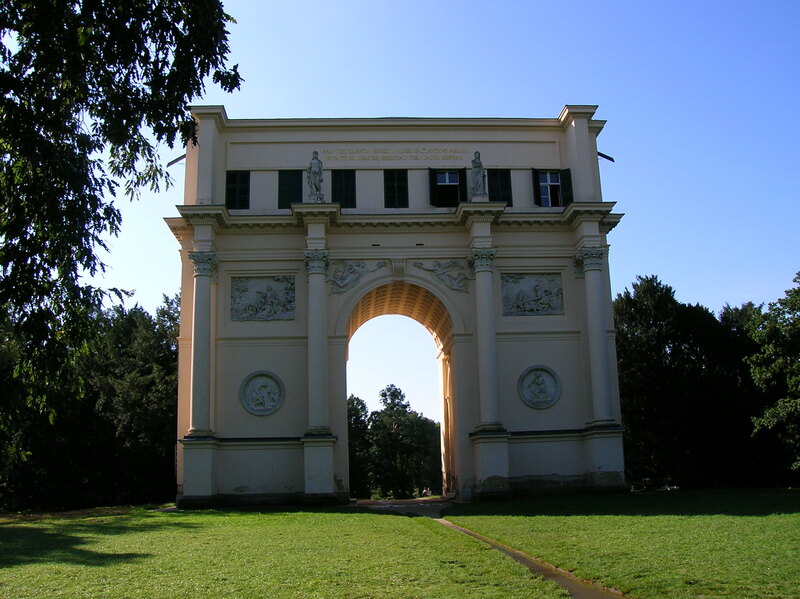 Dedicated to Diana, goddess of the hunt, it looked like a triumphal arch but was really a hunting lodge. Inspired by Roman architecture from antiquity, it had a terrace that must have offered splendid views. Allegories of hunting were portrayed on reliefs. I was surprised how the building was in harmony with nature. 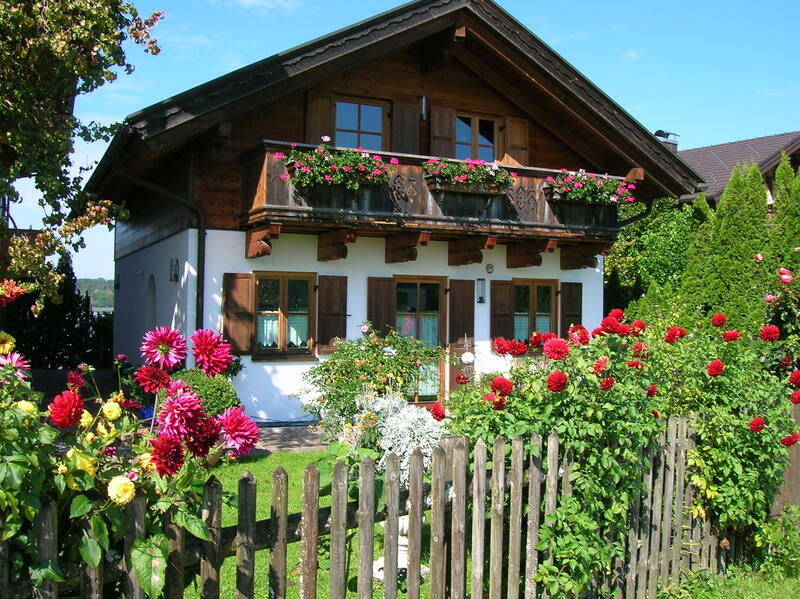 It complemented its natural surroundings instead of intruding upon nature. There were more structures in the park that we did not have time to see. For instance, there was an obelisk, a fountain, more temples, manor houses and a chapel that all belonged to the Lednice – Valtice area. It would take a visitor days to see everything. We went by boat to Břeclav and then took a bus back to Prague. The trip was splendid. Our tour guides were excellent and enthusiastic about their work. 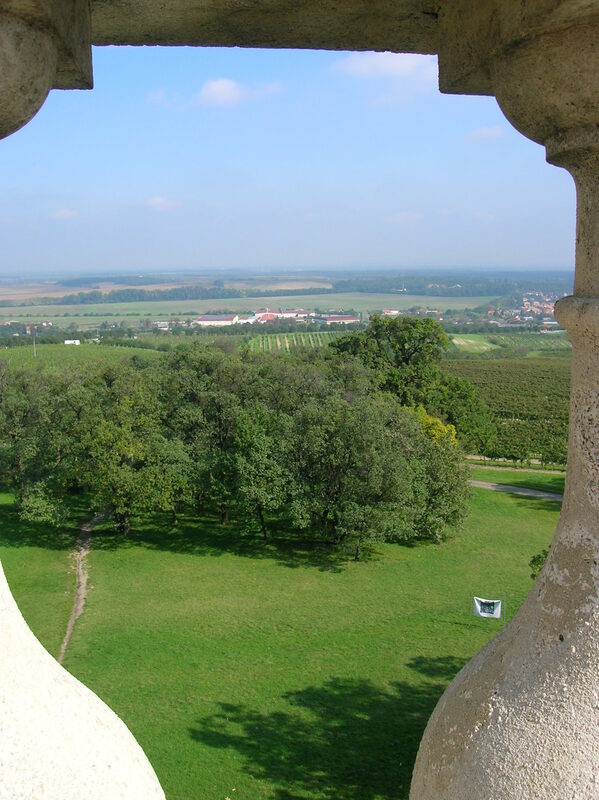 I was so glad that I was able to devote so much time to the Lednice -Valtice area as opposed to seeing only the interior of the two chateaus that left me in awe every visit. This part of south Moravia was certainly a special and magical place.